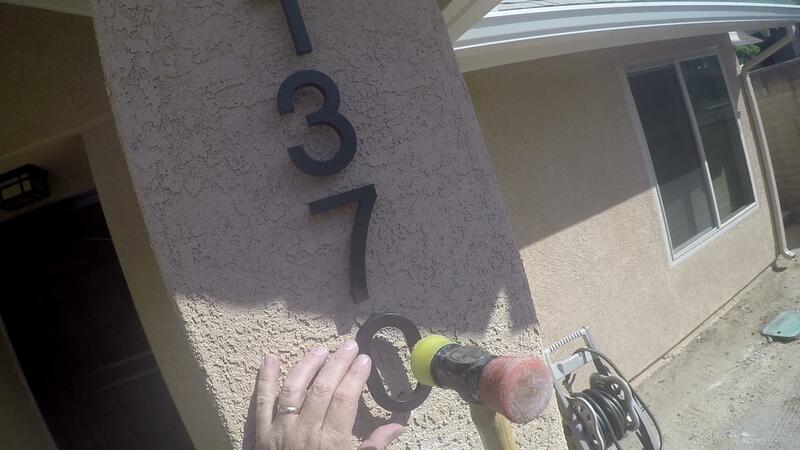 Now that the garage door was up, I was in the mood to finish off the outside, and one of the last pieces of finish work was putting up the house numbers. Our house had been “numberless” for over a year, and it was high time to give it back some dignity. As always, I decided to put some thought into this project because I felt that your house numbers are the first thing a person will look for when visiting. So if they’re placed so they’re difficult to read, or if they are installed crooked, or if they aren’t in balance, they really can detract from the curbside appearance. On the other hand, if they are tasteful and good looking, they really can be a very nice architectural detail instead of just being some “requirement”. I initially did some online shopping with the big box stores (Home Depot and Lowe’s) and they had the standard ho-hum selections, so I started poking around and found some really classy numbers from a mom-and-pop outfit in Phoenix, AZ. They are called Modern House Numbers (http://www.modernhousenumbers.com) and I thought that they had not only very elegant designs, but also a quite superior product. Their numbers are made of solid CNC aluminum, are powder coated in appropriate colors, and they have a very interesting mounting system that uses little posts to offset the numbers from the wall surface, giving the numbers a 3D appearance. Yes, they cost some money, but hey, this is my house and my remodel. Plus I felt that the house needed something special after being numberless for a year. Locate them properly. Although Modern House Numbers provides you with a template, you still have to put it in the right place so it is easily seen from the street and is consonant with the architecture of the house. No need to get obsessed with the placement, but consider a number of options and choose what looks “right” to you. If you don’t have a template, then my recommendation is to put your numbers on a sheet of paper in the orientation that you want and MAKE a template. All you have to do is mark where the screws go. Eyeballing the alignment and spacing while standing on a ladder is just faking it and will result in a hack job. Placing the template is the first crucial step. Drill the holes. For these numbers, you’ll need to drill a certain depth because of the posts that offset the numbers from the mounting surface. 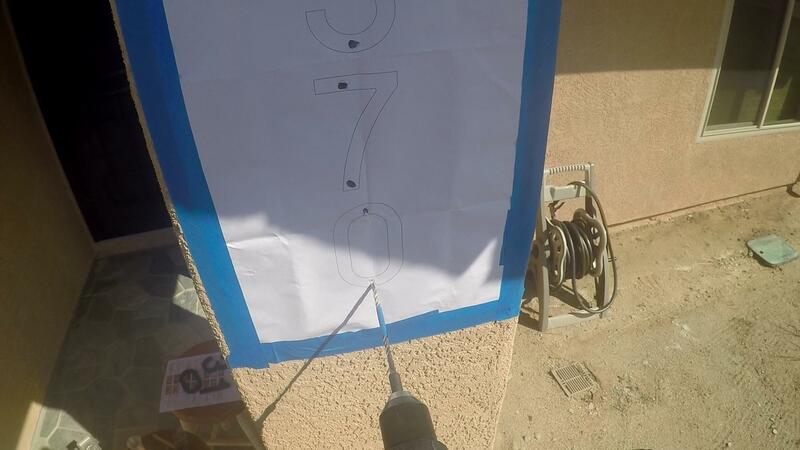 If you’re just using numbers that are directly screwed to the wall, then just mark the locations according to your template and either drill pilot holes (for wood) or holes appropriate for your mounting surface. 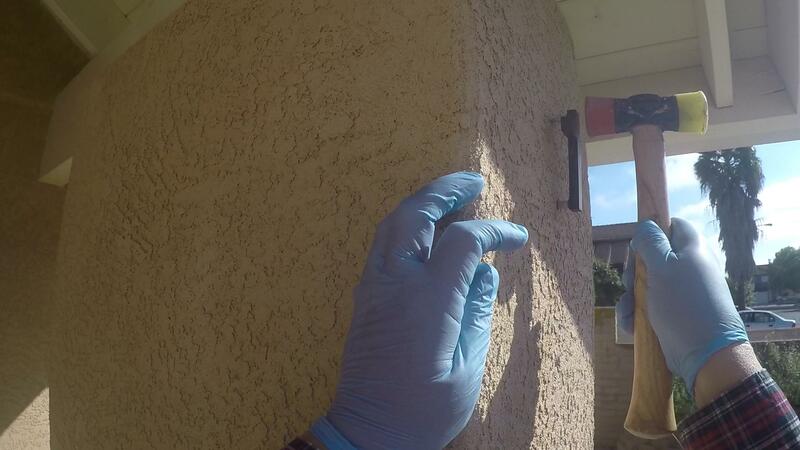 If mounting in stucco, then try to use screws designed for stucco. You may have to paint the heads to match the numbers. The other option for masonry walls (e.g., stucco or brick) is to use masonry anchors. These require a little more work, but you still have to locate the holes correctly so the numbers will be in alignment. Drilling the mounting holes using the template. Dry fitting the numbers is very important. You don’t want to find out you didn’t drill deep enough with epoxy running all over the place! Apply the epoxy. Disregard this step if you’re mounting the numbers directly to the wall. Epoxy is a miracle glue. It sticks to almost everything, is gap filling (meaning that if your hole is too big, it will fill in the gaps), and is waterproof. People who make high-end wooden boats use this stuff throughout, and it is amazing what can be accomplished with a fiberglass reinforced epoxy topcoat. The fiberglass disappears and you can see the beauty of the wood underneath and still have an incredibly strong and abrasion resistant surface. You can also see all the imperfections, which is why these creations are truly artisan. 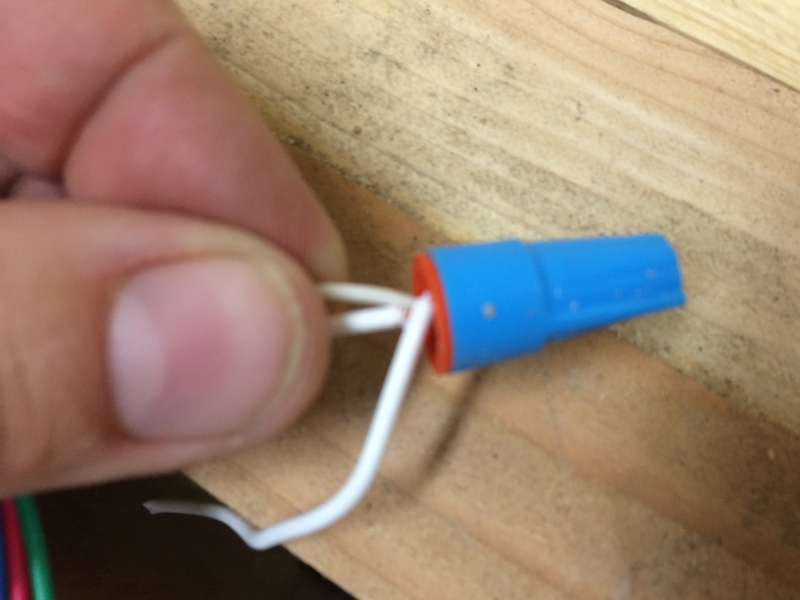 But I digress… The important thing to remember about epoxy is that the advantages can become disadvantages. Remember how it sticks to everything? Well, that’s EVERYTHING. So, if you don’t wear nitrile gloves, you will be scraping dried epoxy off your fingers for 2 weeks. (I know this from personal experience.) If you get it on something you don’t want it to get on, then it will be almost impossible to remove. You need to seriously think about how you will handle the goop so it doesn’t drip where you don’t want it, and protect the surrounding area from the drips that inevitably do happen. Putting the epoxy on the posts. Not too much time to waste as I only have 5 minutes to get all the numbers mounted! The other thing worth mentioning about epoxy is working time. Your have several choices, ranging from short (5 min), to long (hours). For a job like this, you probably want a short working time because if you do the preparation and pre-fitting correctly ahead of time, you shouldn’t need a lot of time to do the final assembly. For this project, I used 5 minute epoxy and did the installation in two steps: mounting the posts to the numbers, and then mounting the number-post assemblies to the wall. The video shows the details. 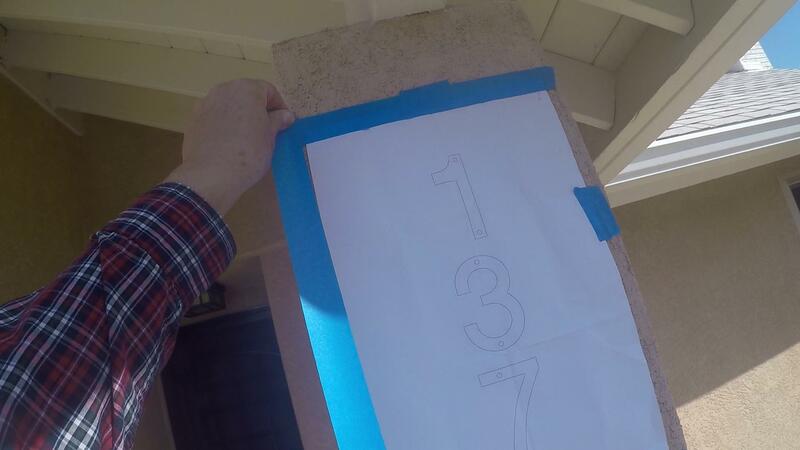 The final step is to set the epoxy-laden pins into the holes in the stucco to set the number. House numbers all done. Looks good! The finished product looks really nice. As always, there were a few boo-boos, but remember the craftsman’s axiom: The difference between an experienced and inexperienced craftsman is the experience one has in hiding mistakes. It’s been awhile since I’ve put in an entry, and there’s really no excuse other than the holidays, a vacation, and not making enough time for it. So, the next few entries will be to catch up a bit and get back into the flow of regular blogging. Since the last entry, I’ve completed all of the contracting work, and if you look at my bank account, you can tell. 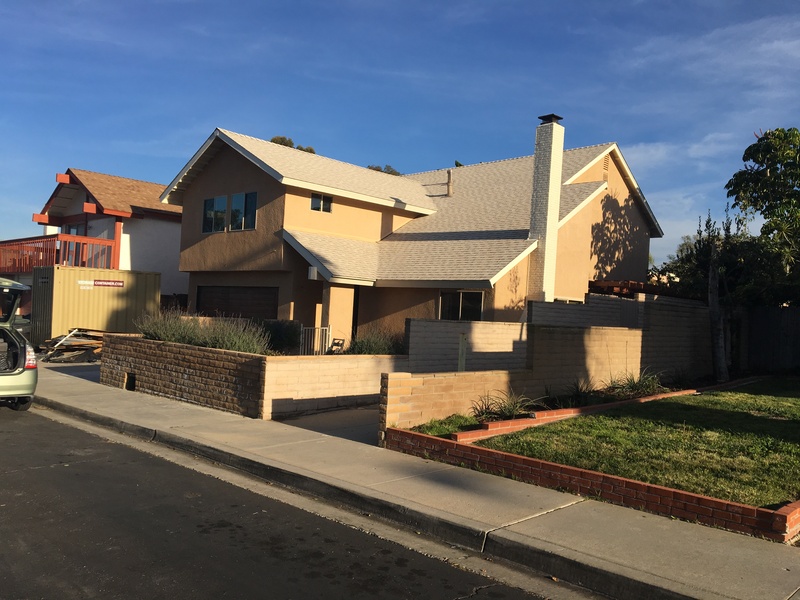 Going into this project, I knew that the contract work would be the largest overall expense, especially when you’re talking about new windows, a new roof, re-stucco, exterior paint, and a brand new HVAC system. The HVAC system cost quite a bit, but believe it or not, less than the stucco. Be that as it may, these are simply jobs that a DIY’er cannot accomplish. 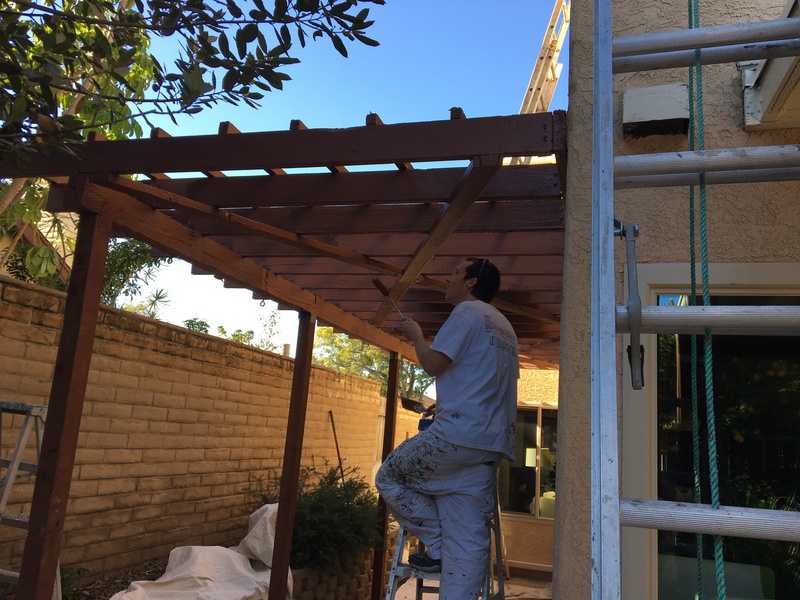 Either they require a crew, as is the case of the HVAC system or most anything that has to do with stucco or concrete, or is just too tedious and inefficient to do by yourself, such as roofing and exterior painting. Plus, I had enough experience dealing with heights, so that was enough of that. The HVAC installation was fairly smooth. 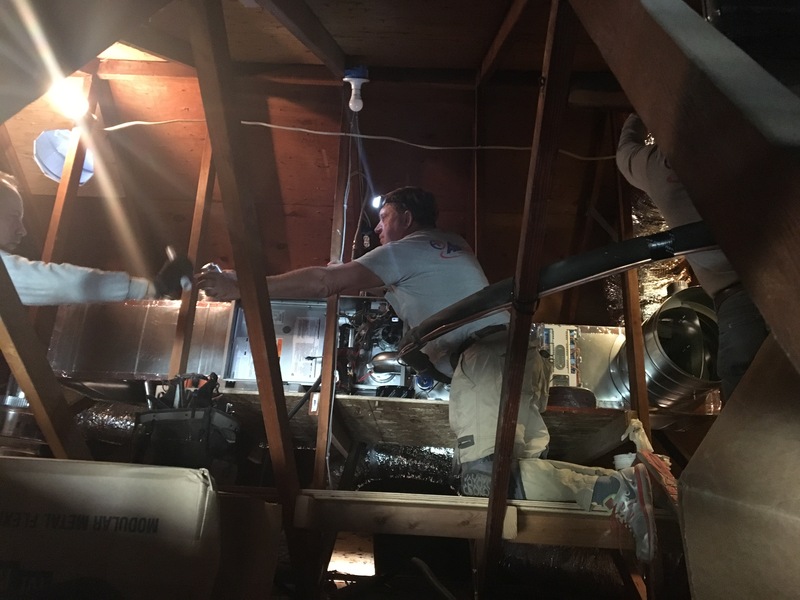 Once I settled on a contractor and a date, they came in, took all of the old stuff out, installed the mechanicals in the attic, and then ran all of the ducting. 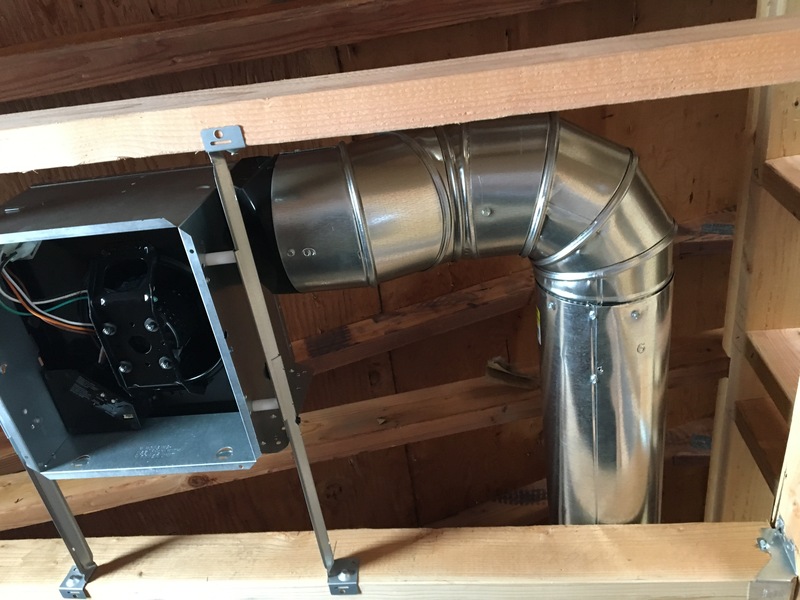 There are plusses and minuses to putting the HVAC mechanicals in the attic, but for me, the plus of getting the mechanicals out of the garage and simplifying the ductwork outweighed the noise factor (the system is super quiet to begin with) and the minor loss of efficiency by having the mechanicals in a hot attic. I think the fact that I have a cool roof and excellent attic ventilation will significantly reduce that concern. The new HVAC system involved a lot of ductwork. I ended up with a 3 zone system. Upstairs, downstairs, and MBR. Yes, my MBR is going to be the ultimate retreat and I wanted everything to be the best. More demolition to make way for the HVAC system. The fun never stops! 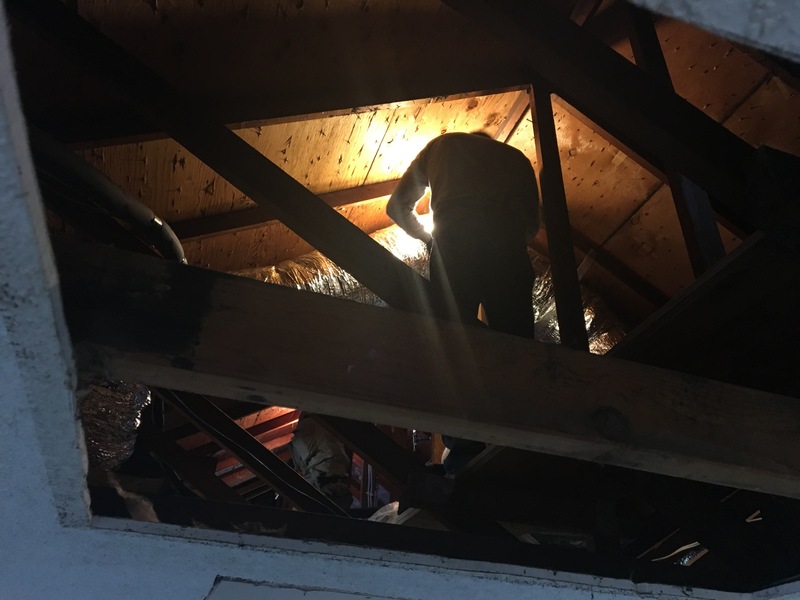 HVAC folks working in the attic to put the system in place. The attic is a tough place to work in, so I’m glad they’re doing this instead of me. The lead installer getting the mechanicals in order. 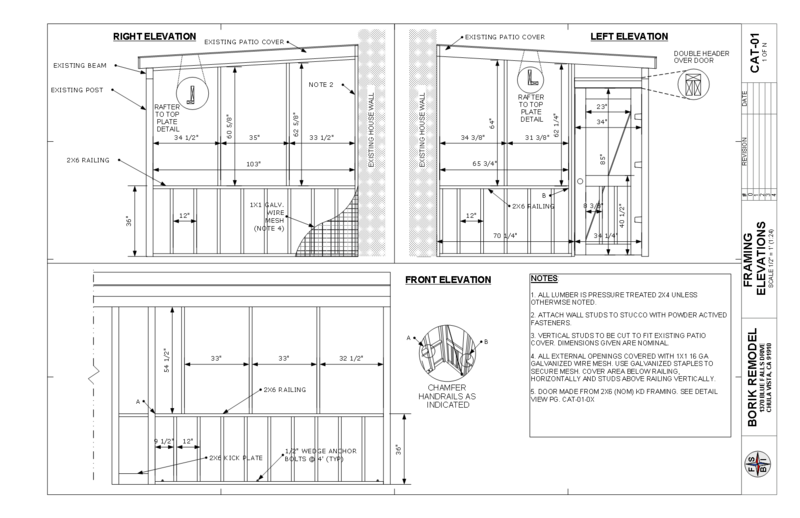 They had to build a support framework in order to place the furnace, air handler, and cooler. Fortunately, the manufacturer (Carrier) makes these units so they can be installed horizontally, which works great in an attic configuration. 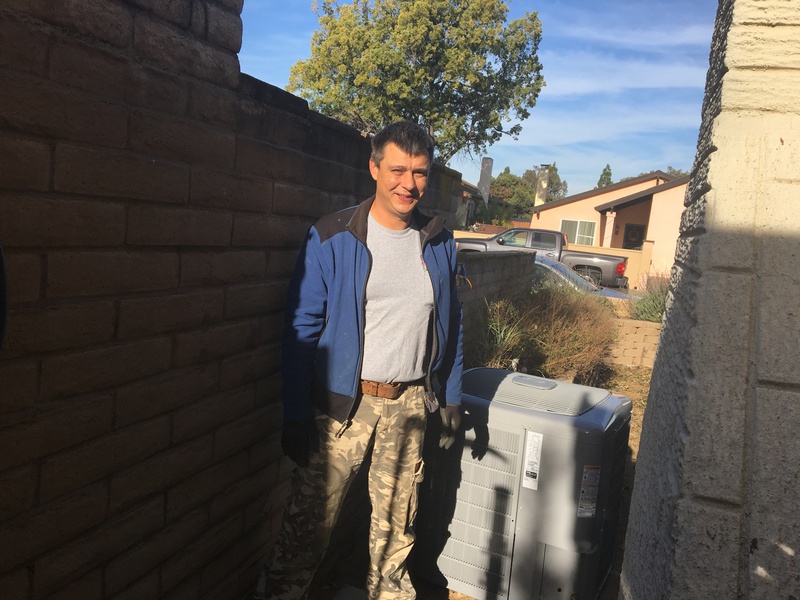 One of the HVAC installers, proudly standing by my new condenser. Having A/C put in was a major objective of my remodeling project. The leftovers of the chimney of the old furnace. 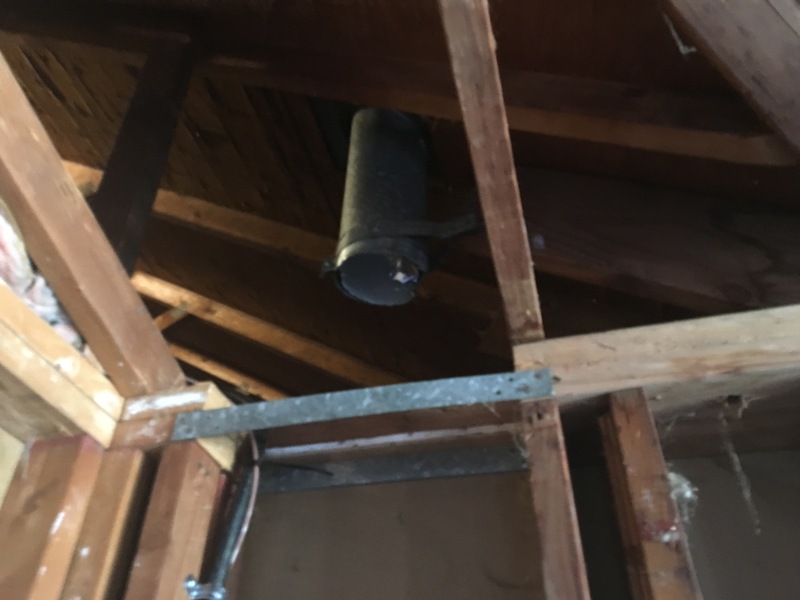 Ideally, I would have installed the HVAC system before I had the roof finished, and this would have precluded this extra “stack” but that’s not the way things worked out. Maybe I'[ll get this removed when I do solar (in some future lifetime). One thing that I had to take care of by myself was to hook in the condensate drain into the house drainage system. Not too big of a deal, but the installer talked me into it, and I didn’t say no. Perhaps it was better because I know I did it right. 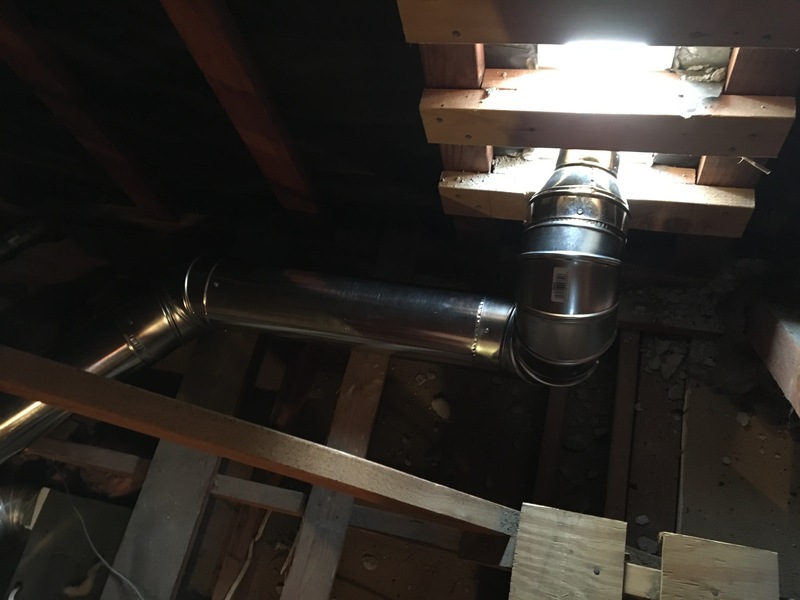 SOME of the HVAC system was DIY. In particular, I needed to construct ventilation ducts for my MBATH fan. Since I will have to do that for the other bathrooms, the laundry room, and the kitchen, I decided to invest some time in educating myself in the proper techniques and investing in a few tools to make the job turn our pro. 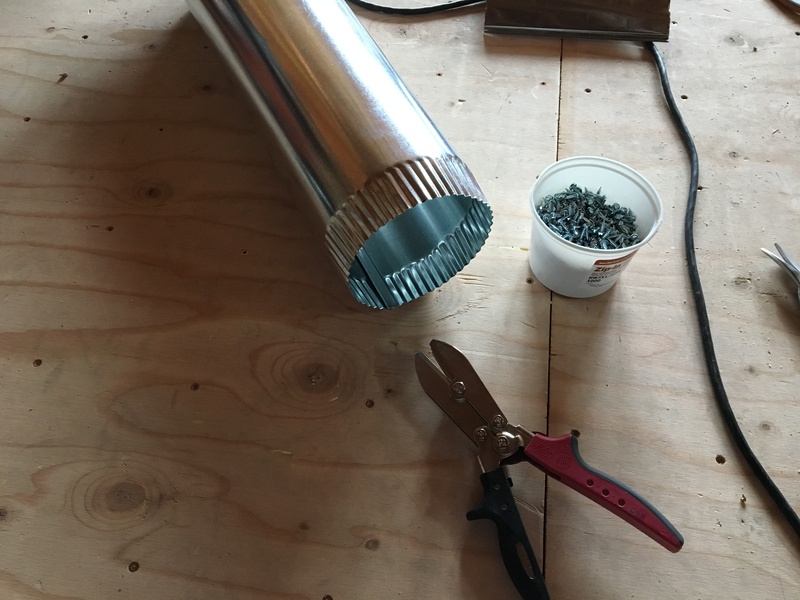 This shows a special crimper that is used to make a cut-off in ducting into a fitting that can be properly inserted into the next ductwork section. Here is the MBATH vent going out. Lastly, the painters came along and finished all of the trim work and exposed woodwork. This really made the place look nice and everything started to look finished from the outside. I got (and still am getting) a lot of positive comments from my neighbors. Painter working detail on my trellis. This was very difficult work and he took two days doing it. The results were magnificent! 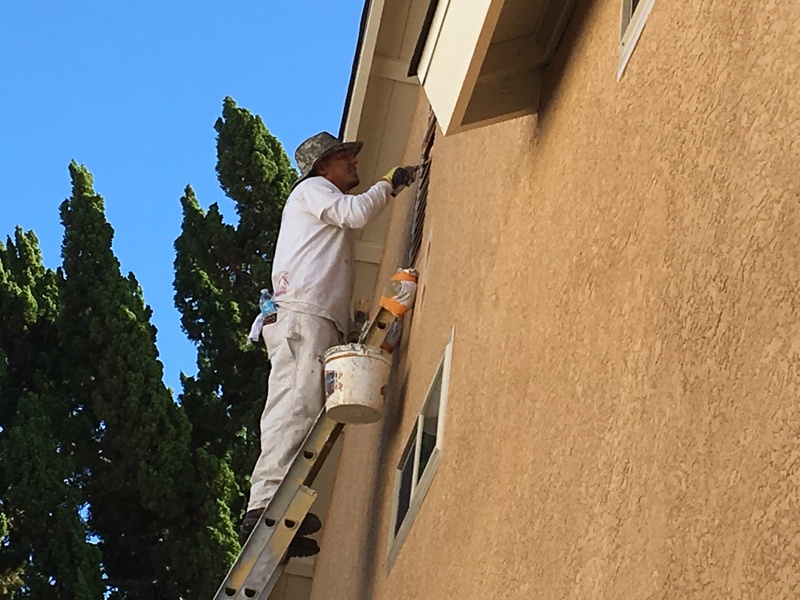 One of the painters working the detail of the gable vent. Notice how he is up high on a ladder. Better him than me! 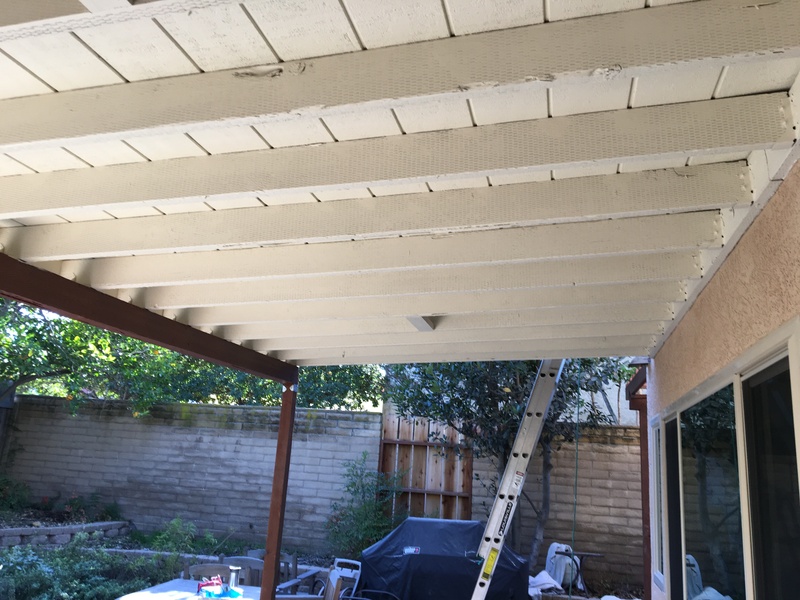 I decided to paint a light color underneath the patio cover. This is reminiscent of how porch covers are painted in the South. Bringing in these Southern elements no only pleases Stella, but also lightens up an otherwise dark space. Those Southerners certainly know their onions! My side yard painted nicely. I had left this unfinished and it really was beginning to look shabby. I knew I needed to paint it, and I’m glad I finally had it done. 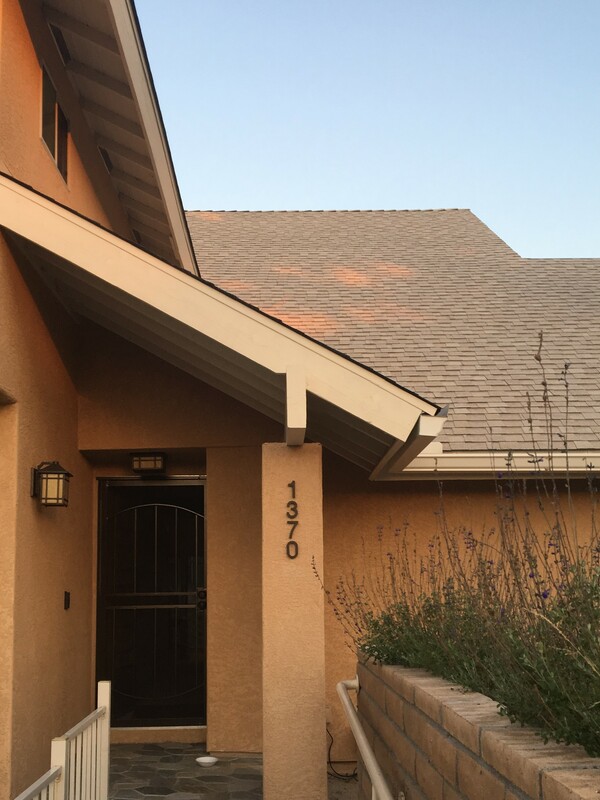 The paint match with the stucco is perfect! See how the otherwise gray electric panel now simply melts into the rest of the structure? Same with the gas line. Professional painters are masters at color matching, which is another reason that hiring a professional painter is well worth the expense. Wonderful picture of the project after painting. This is really looking nice! In fact, I got a letter from the my homeowners association asking when my storage container was going to be moved. Unfortunately, I had to explain that while the outside of the house looked great, the inside was a total disaster and I had at least another year of work before I was finished. Since the time the contractor work was complete, I finished off some plumbing and electrical work for the Master Bedroom and got an inspection. 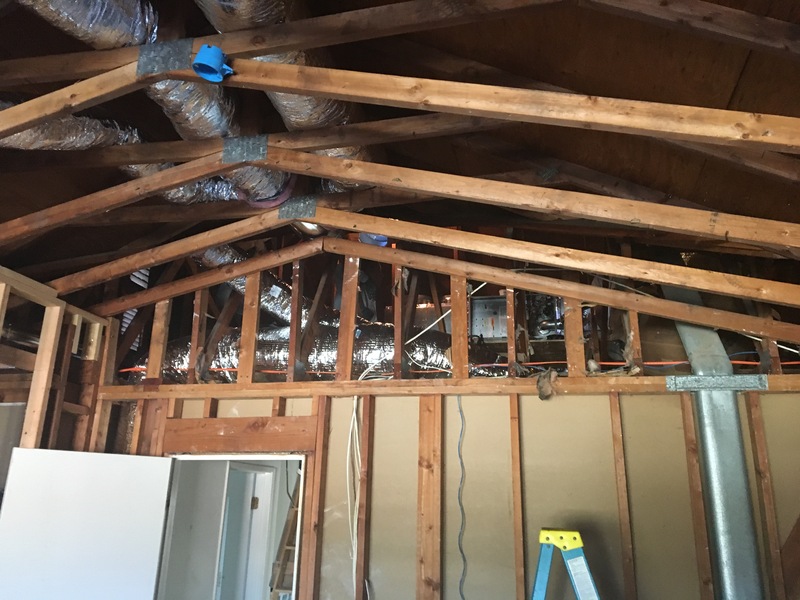 I was going to write up some of the details of the electrical and plumbing, but decided to wait until I did another round of it as I have several other rooms to renovate. 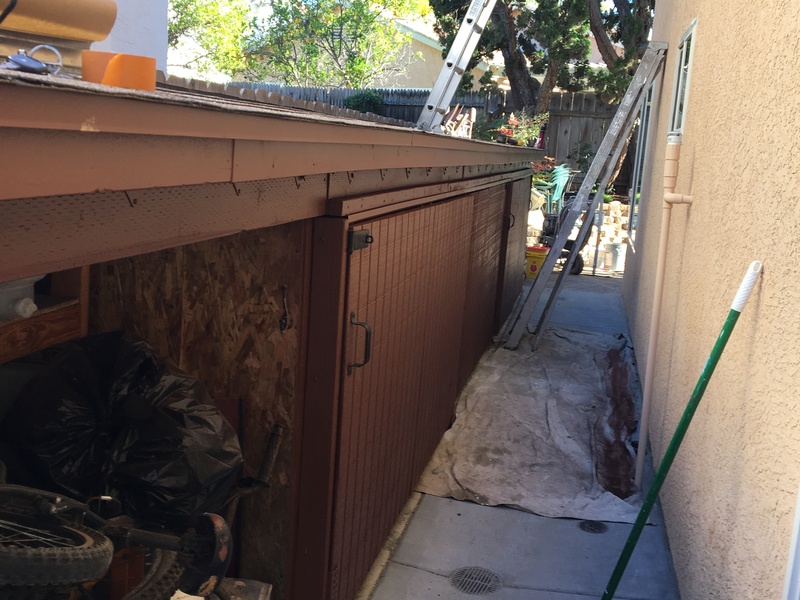 In and amongst the holidays, I was able to wrap up the outside work so I could go into the New Year with a clean slate and start on the OTHER part of the remodeling project — the INSIDE!! The good thing about finishing up was that the work could be easily broken up into short stints so it was relatively easy to fit this remaining effort into a busy holiday schedule. 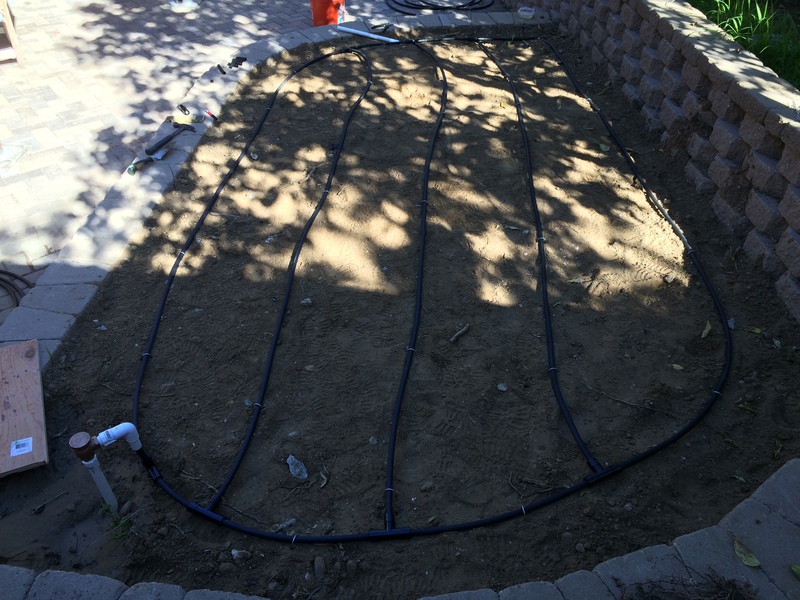 First on the list was completion of the drip irrigation system. I bought all of the parts over a year ago, because I had to install a bunch of stuff underground, so what is shown in the photos has been gathering sawdust in my garage for over a year. Maybe that wasn’t the smartest thing to do because a few things changed during construction of the planters and retaining walls, so I ended up overbuying some things, but I definitely wanted to get all the parts from the same manufacturer (Rain Bird) to make sure that they all fit and worked together. I have a previous post on the design of the irrigation system if you’re interested. 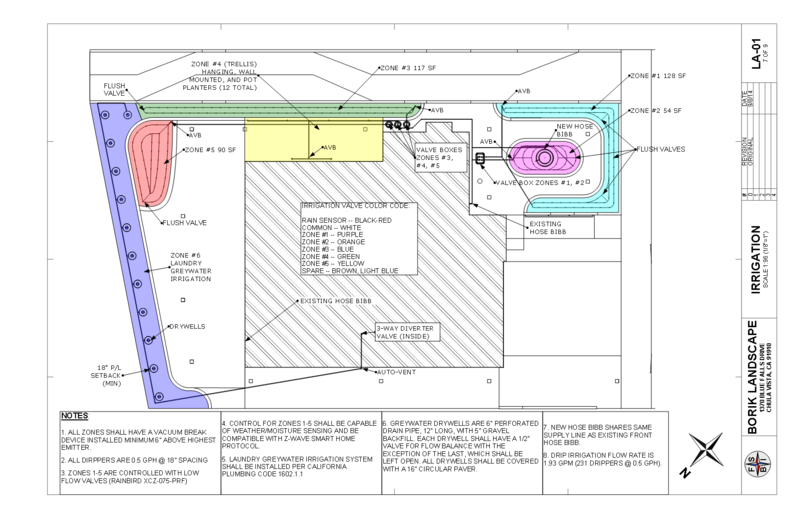 Irrigation plan details. The laundry greywater (purple) is already installed and all of the underground pipes and control wires are buried and ready for hook-up. The first thing that I needed to do was to hook up the wiring. This is not terribly difficult to do, but you do have to keep track of which wires are doing what. In my case, I have a total of 5 zones, which means 5 valves, plus a rain sensor. Each valve requires one dedicated wire, and another connection to a common wire, which makes 6. 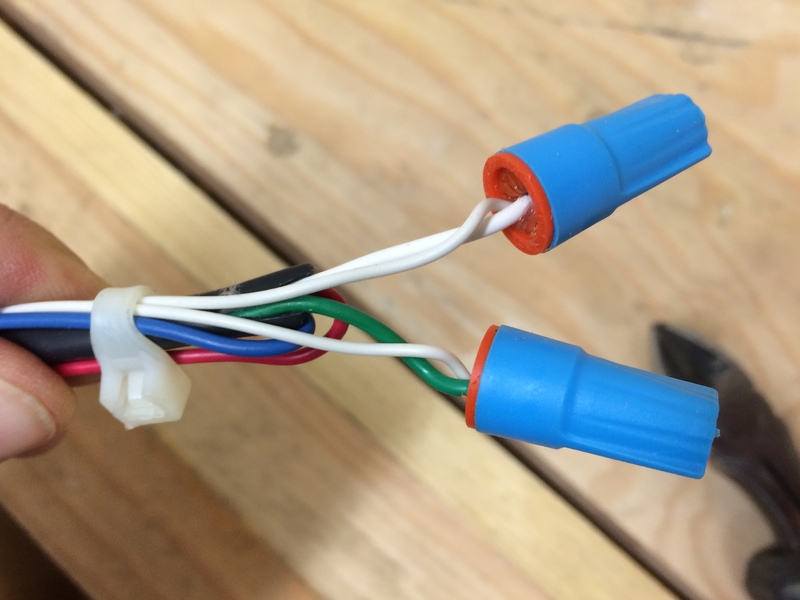 The rain sensor requires 2 wires, so that’s a total of 8 wires. Plus, you always want a spare or two, so I ended up getting a 10 wire control cable. Now comes the important part: WRITE DOWN what color goes where, and then COPY that to someplace that you will remember. Most folks just write it down on some sort of sticker that they put on the inside of the irrigation controller door, but because mine is going to be part of a smart home and connected to the home controller via ethernet, it won’t have a door, so I’ll have to figure out something else. 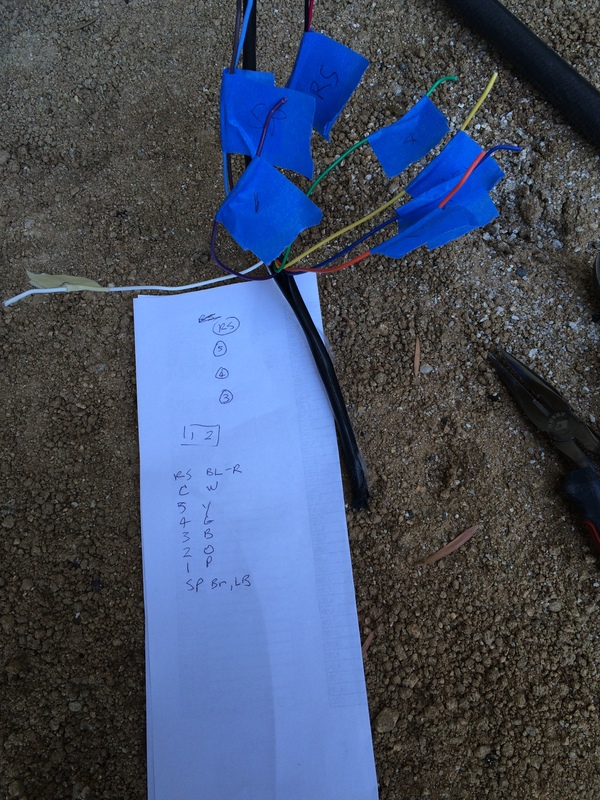 This is my plan for mapping the irrigation zone numbers to the wire colors. I sure hope I remember to put this somewhere where I won’t forget about it or throw it away! Connecting the wires is pretty simple. 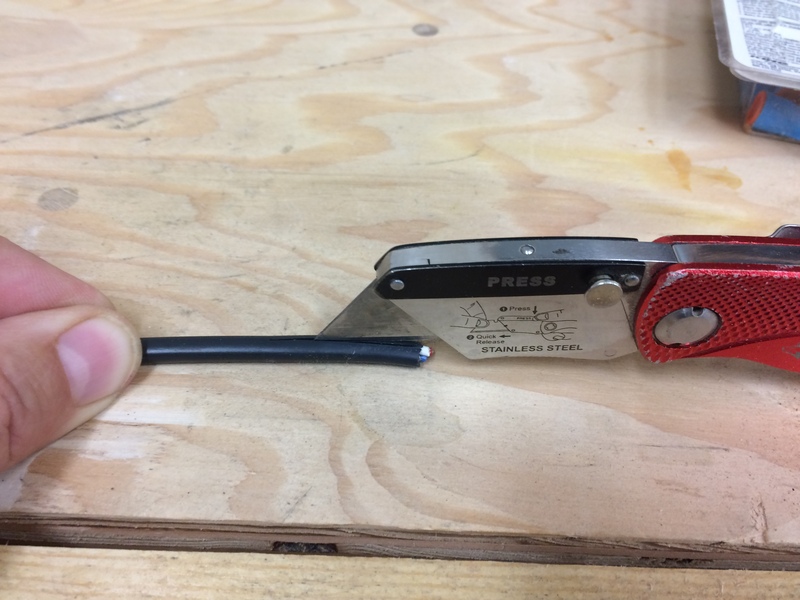 The wires are fairly small (18 gauge), so you’ll need a wire stripper that accommodates the smaller size. I found out this the hard way years ago, so I now have two wire strippers that cover most all sizes between the two of them. Don’t be all cheap and use a knife to strip the wires. You’ll damage the wires, AND your fingers. 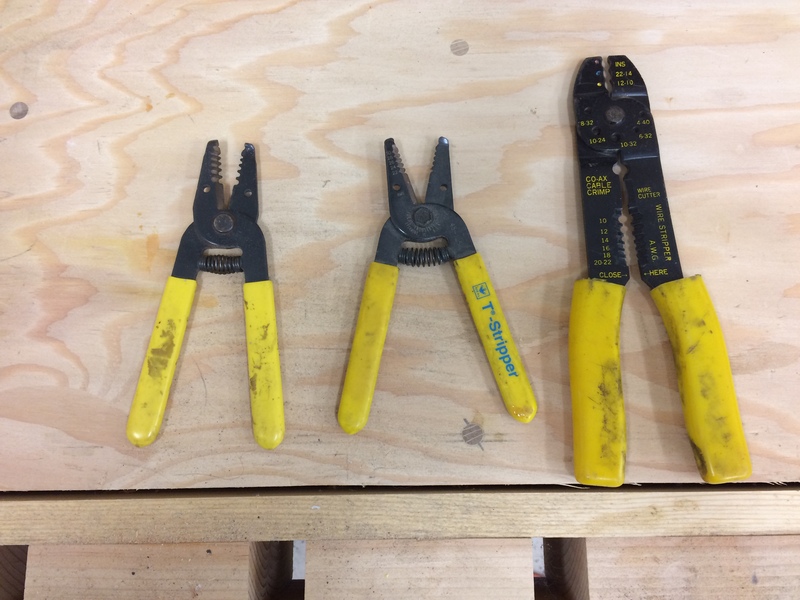 Types of wire cutters. The one on the right is pretty common, but I’ve always had trouble with it. I bought the others which are specifically designed for stripping wire (and nothing else). 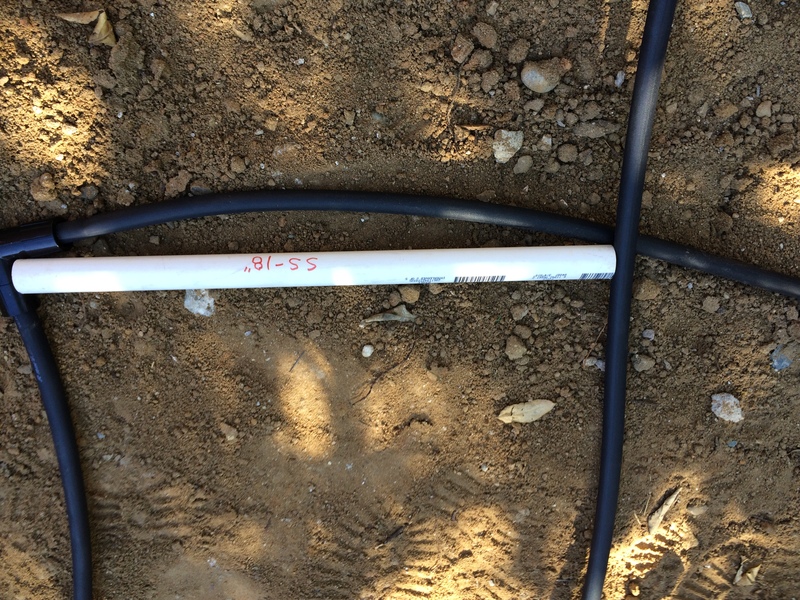 The one on the left is mostly used for residential wiring (which includes the irrigation control wires). The one in the middle is what I use for wiring electronics (smaller wires). The way to properly join the wires together is with waterproof wire nuts. They work just like regular wire nuts, but they are stuffed with petroleum jelly (Vaseline) and have a flexible retainer on the bottom that holds the goop inside. You’ll want to get the smallest ones. If in doubt, the package will have the number and combinations of wire sizes that you can use with that particular size of wire nut, so you should be able to figure out what you’ll need. 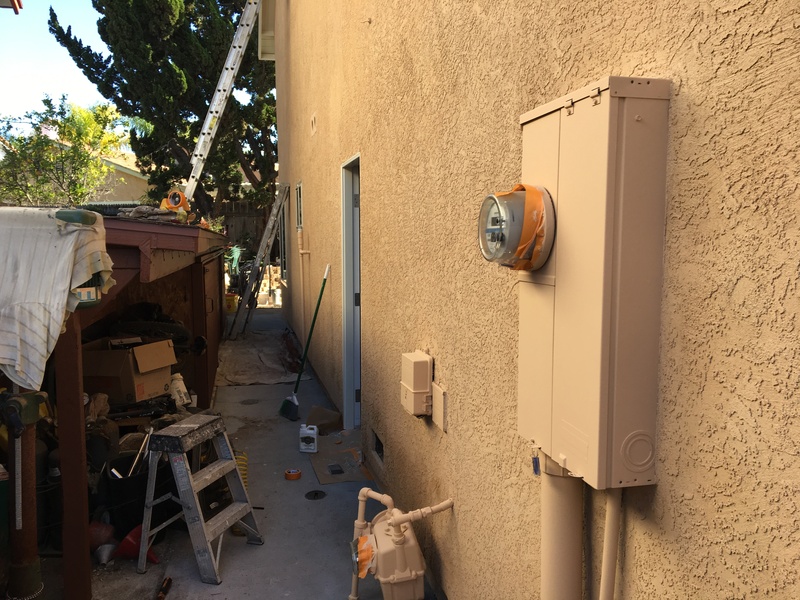 Turns out that the sublime skill of choosing the correct wire nut is vastly more important when working with standard residential electrical circuits (120v/240v), so it is a must-learn for the serious do-it-yourselfer. Tools for the wiring hookup. 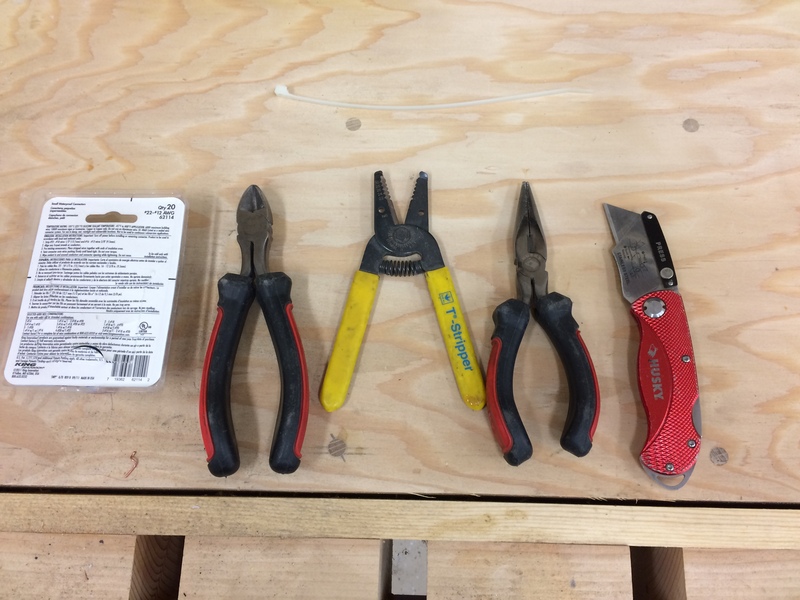 From left to right, you have the waterproof wire nuts, a set of “dikes”, wire stripper, needle nose pliers, and a utility knife. Now that you have the right tools and materials, it’s pretty straightforward to hook everything up. You’ll have to “daisy-chain” the common wire, meaning that you’ll take the incoming white wire, outgoing white wire, and valve wire and twist all three together, and then go to the next one, etc.. Just remember to follow the color codes that you made up earlier. One quick note about the valve wires: it doesn’t matter which one you choose to be hooked to the common (white) wire and which you choose to hook up to the individual colored wire. That’s because the valves work on 12v alternating current (AC). Since it’s low voltage (i.e., cannot cause a fire or deadly shock), there aren’t any complicated rules about neutrals or grounds, so, bottom line, it’s pretty hard to f*** up. One other thing about electrical wiring is that it pays to be neat. Sure, if the electrical connections are correct, the darned thing will work, but making things neat and secure will not only make it much easier to troubleshoot and repair when (not if) it is necessary, but will also make those repairs LESS necessary. Plus, you want to have pride in your work, yes? 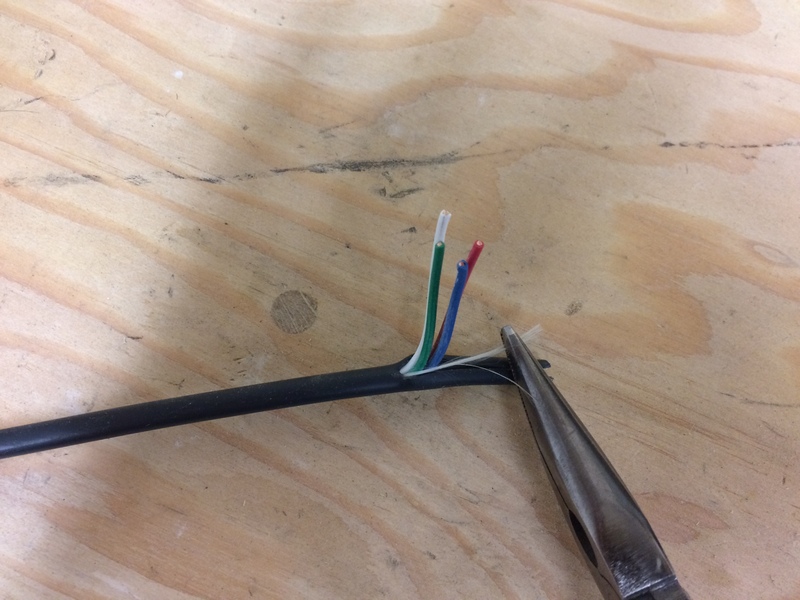 Cut the sheath of the control wire cable with a utility knife. All you need to do is to get it started. 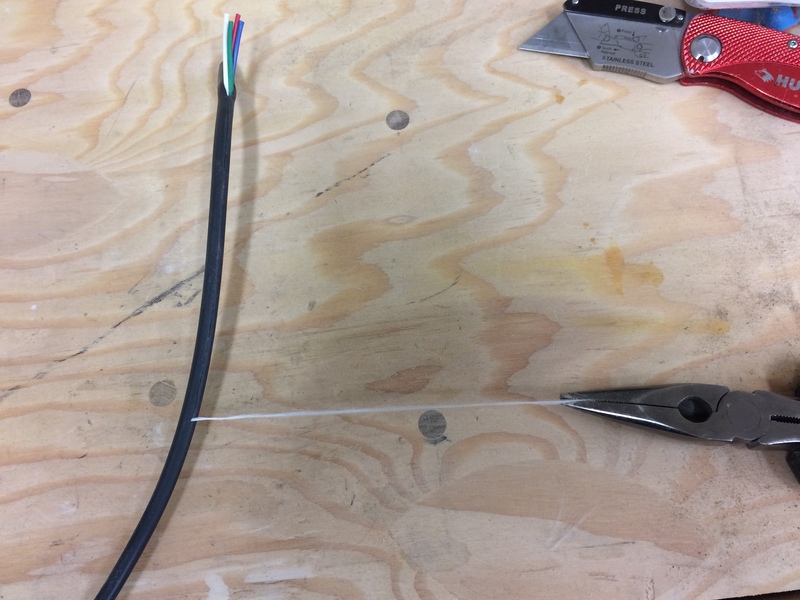 Since you might damage the control wires when you do this, allow sufficient slack so that you can cut this end off after you strip the sheath. 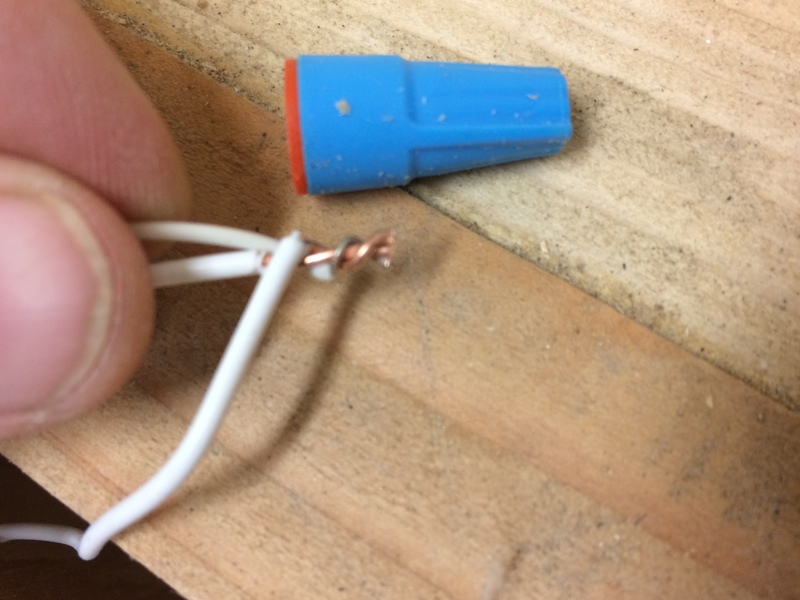 This is a little thread that can be used to strip the cable sheathing. It is pretty difficult to grab with your fingers, so I found using needle nose pliers pretty much essential. The white line does a really good job of cutting through the sheathing. You’ll want to cut a fair amount of sheathing off to give you plenty of wire to work with. You did remember to allow lots of extra cable during the underground installation, didn’t you? 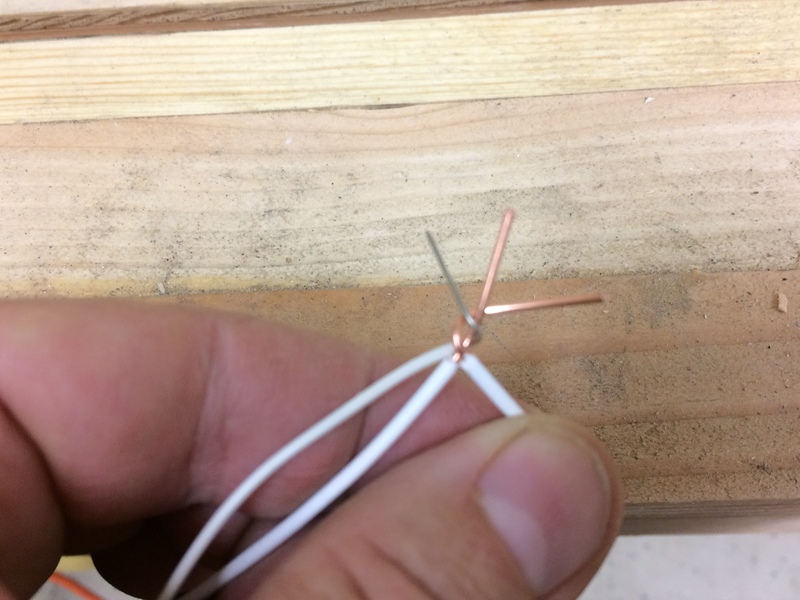 The wire stripper will have several holes, each marked with the gauge of wire that you’re stripping. Find the number that corresponds to the wire you’re working with (in this instance, 18 gauge) and then squeeze the handles and pull off the insulation. 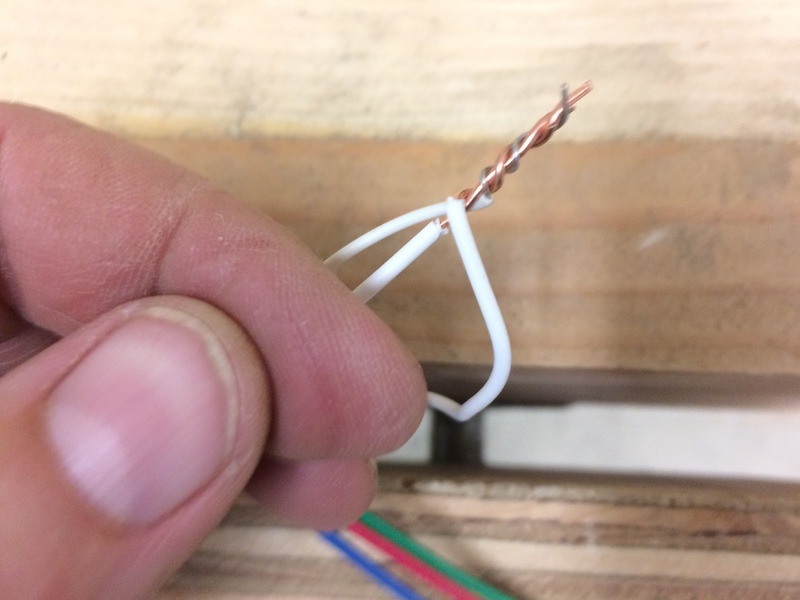 To twist the wire, line up the wires at the ends of the insulation and then twist clockwise. Wires all twisted together and ready for the wire nut. Well, almost…. 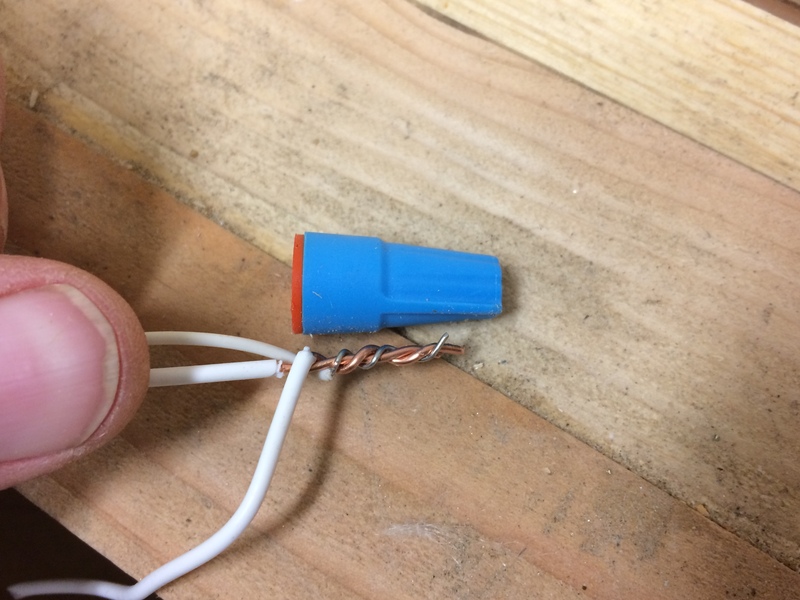 Twisted wires are too long for the wire nut. This is on purpose. Wire is now cut to the proper size. I do this because (a) I want to make it easy to twist the wires together, and that means they will be too long, (b) cutting gives a clean end with all wires at the same length, and (c) The wire ends have little sharp edges which will give a good “bite” into the spring insert of the wire nut when you screw it on. Wire nut properly twisted on. Note that the insulation of the wires goes up into the base of the nut and that the wires are twisted around each other, ensuring a good mechanical connection. 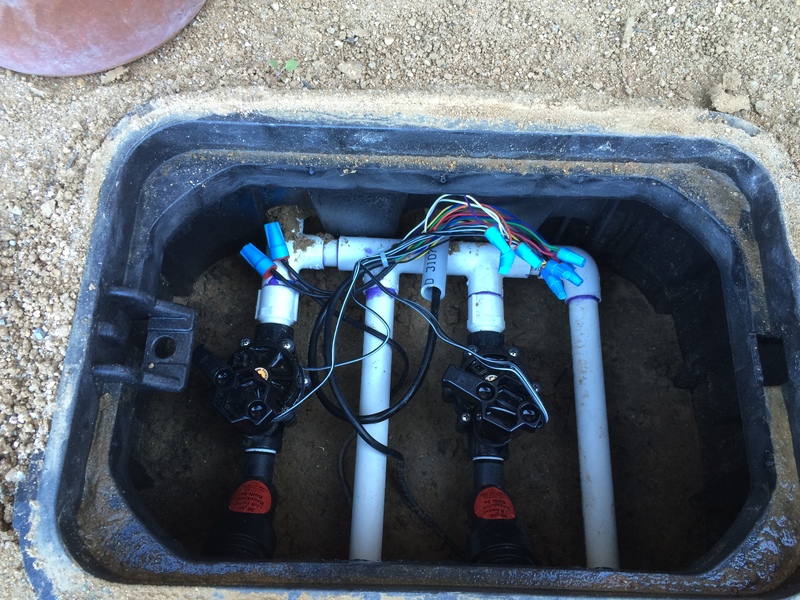 Here is an example of a completed wire assembly for an irrigation control valve. 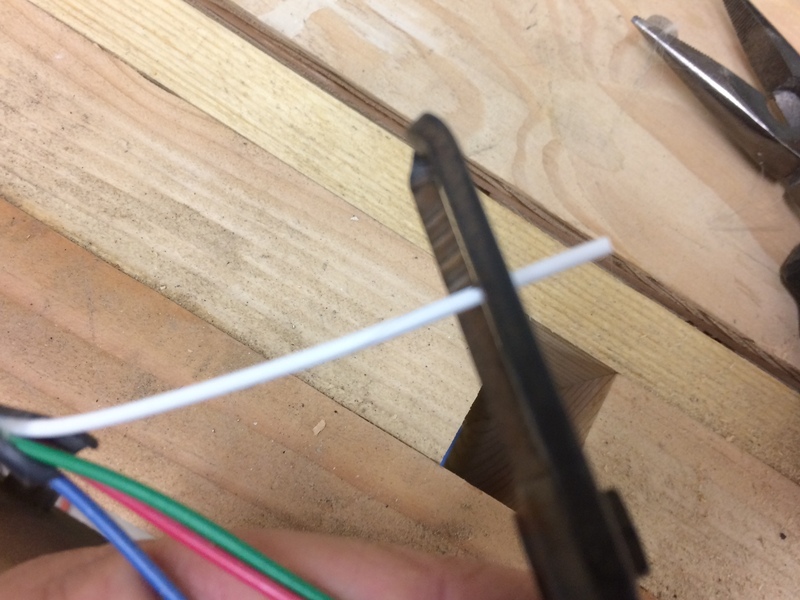 The white wire is the common wire, and the green wire is the color that you used per your plan. You have a plan, right? Control wires in the farthest valve box. I initially used electrical tape to group the wires together but decided that it was (a) kind of difficult to be neat and (b) will be tough to take apart if I ever have to. Nylon tie wraps are better. Control connections completed in the front. Lots of wires, but all are grouped neatly and out of the way of the manual controls. Ready for installation of the driplines and emitters. I’ve had these parts for about a year, so it’s time to get to work! Now comes the nuance. Where do you need to place the drippers? Again, the Irrigation tutorial website gives excellent advice on emitter spacing. It also shows you how to do a simple test to determine the optimum spacing. I did this test and determined that the optimum spacing for my soil was 18″. That meant the each dripper needed to be 18″ from the adjacent ones, and the dripper tubes needed to be 9″ from the edges of the planters, and 18″ between each dripper line. 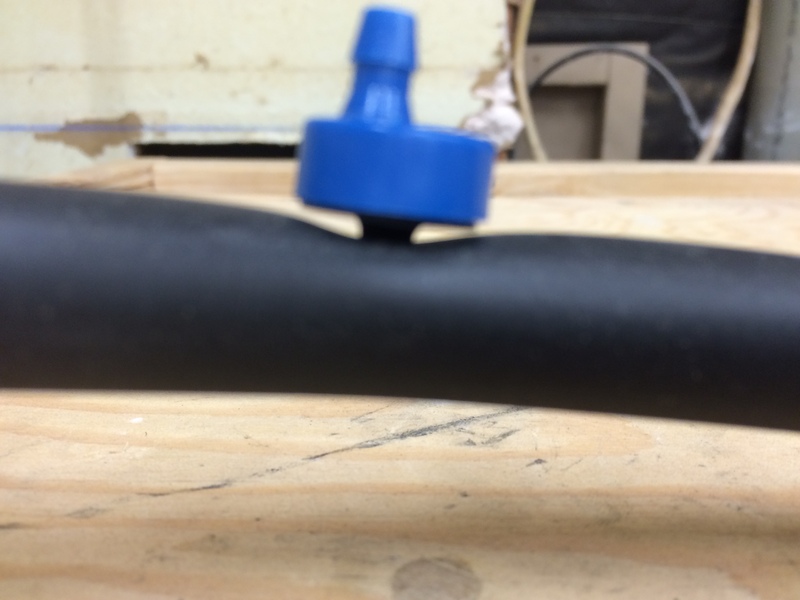 An 18″ spacer stick made from scrap PVC pipe. I used this to space my dripper lines and emitters based on testing that I did earlier. With those details out of the way, I was ready to start actual work. Remember how the irrigation lines were installed in the trenches way back when? Well, the have some dirt inside due to the nature of the assembly process. So, the dirt must be flushed out first, otherwise, you have a bunch of emitters that will get clogged and won’t work. 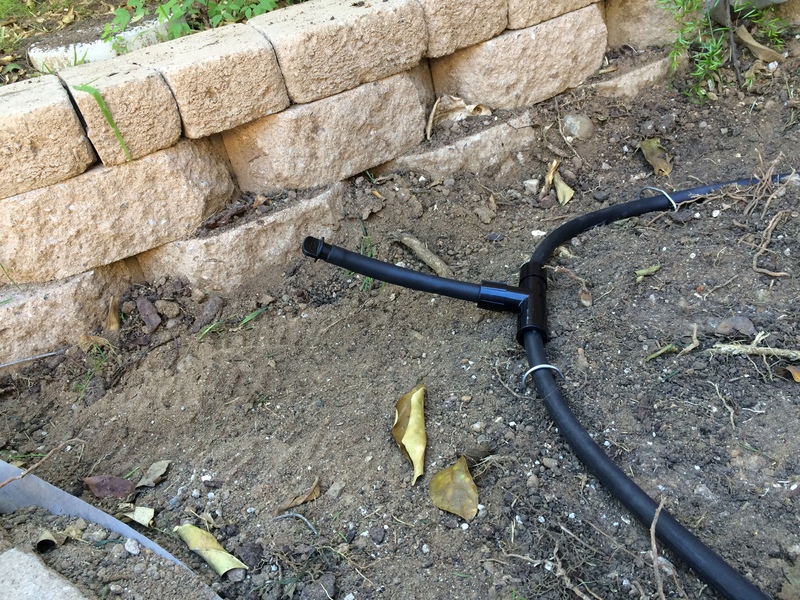 With some trepidation, I turned on the water supply to the irrigation system, and thankfully there were no leaks or blowouts. Not that I expected any, but I’ve been proven wrong before. I then used the manual override on each control valve to thoroughly flush out the piping. 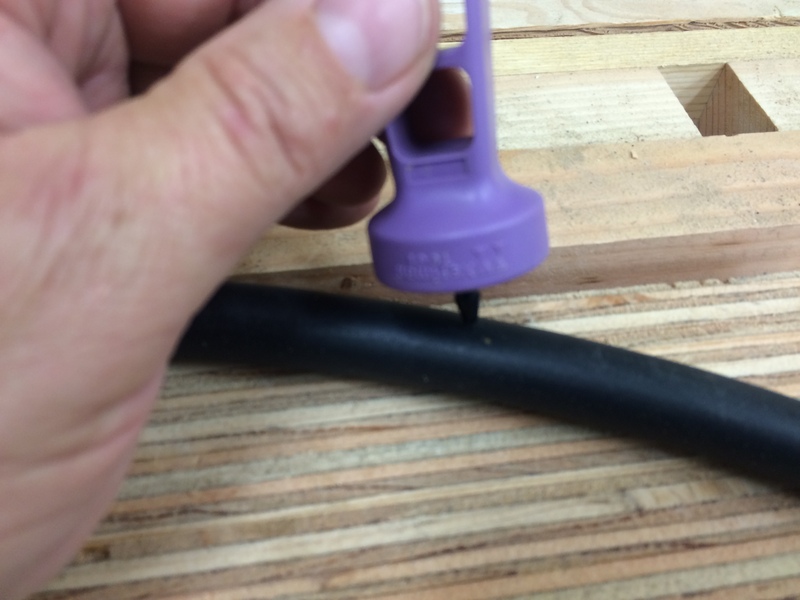 I then installed the mandatory vacuum breaker assembly on each of the stubs, and then was ready to connect the dripline. 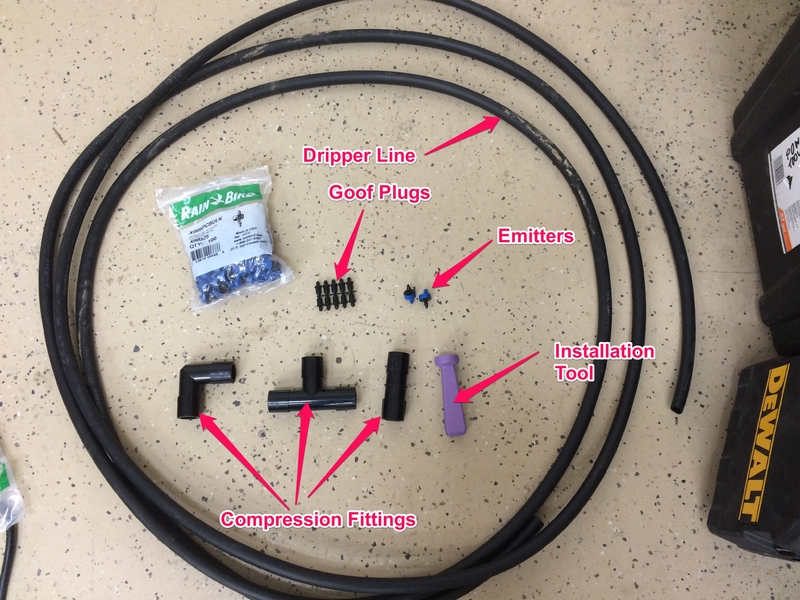 The best way to connect dripline is with compression fittings. These can be a little difficult to work when it’s cold (as it was the day I was doing the installation), but with enough twisting, pushing and swearing, the damn things will go together. Being mindful of the spacing requirements, I laid out the dripline on the ground and used U-shaped stakes (made for the purpose) to hold everything in place. The dripline comes in big coils, so it’s best to try to warm it up in the sun beforehand so it becomes more flexible. 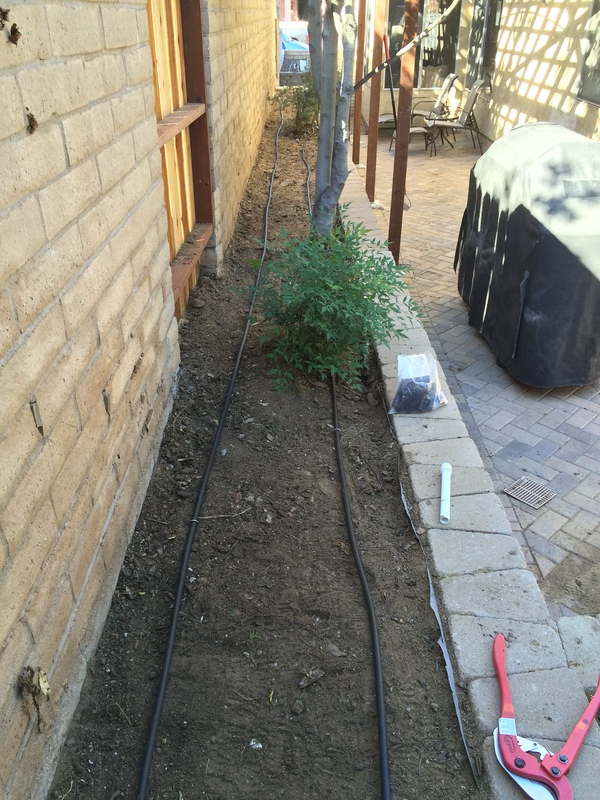 Above ground drip irrigation parts. This is what is known as an Atmospheric Vacuum Breaker (AVB). 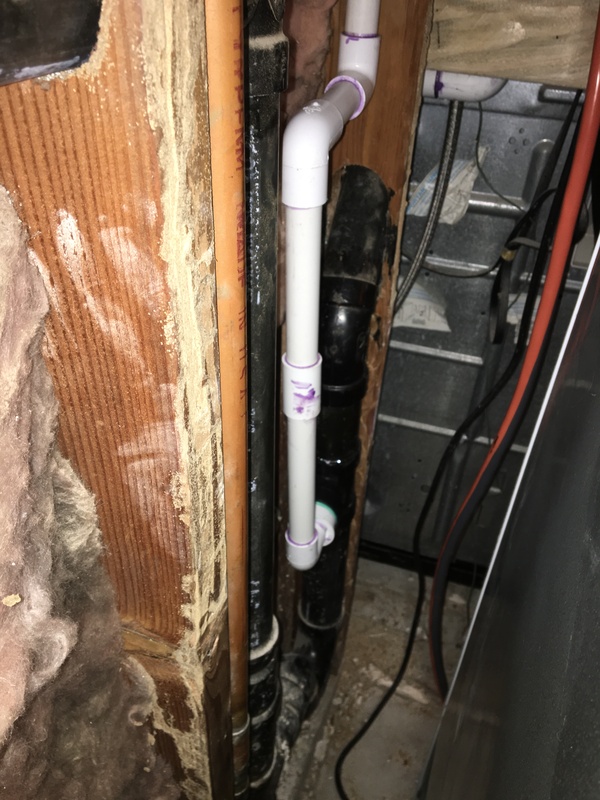 This must be installed at least 6″ above the highest point of the associated dripper line so that you don’t get backflow into your drinking water. We have an outdoor cat, and who knows where he goes or what he does. All I know is that I occasionally find some of his “nuggets” well hidden under the mulch. Best not to take any chances! Getting my driplines warmed up by the sun so they will be more workable. Front planter driplines all connected and staked. The side yard with dripline installed. Dripper lines in the herb garden. Because I want flexibility in this area, I chose to run the lines at a 18″ spacing and do the same with the emitters. That way the entire area will be irrigated. 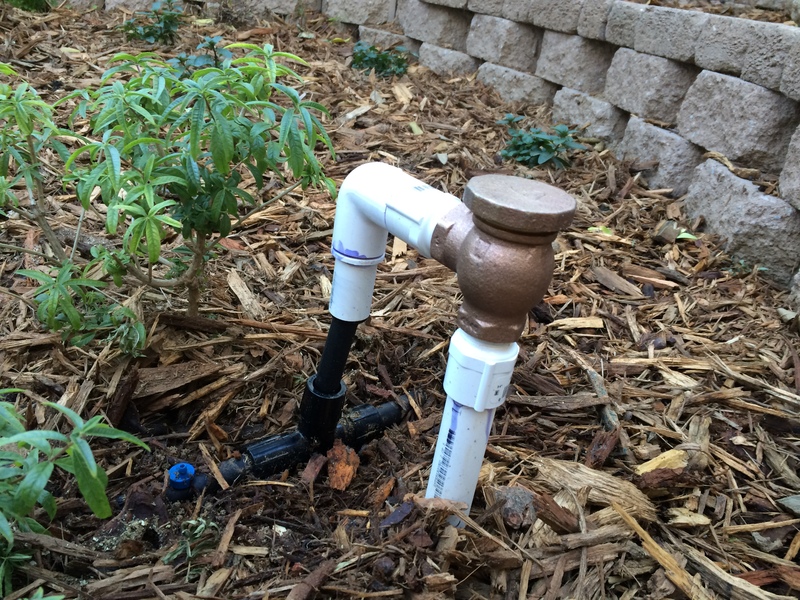 One of the important design considerations in a drip system is to provide a means of flushing the driplines. This will typically be a stub off the farthest end of the line (or a tee if the line is looped) that has a removable plug (that you bought in anticipation of this need). 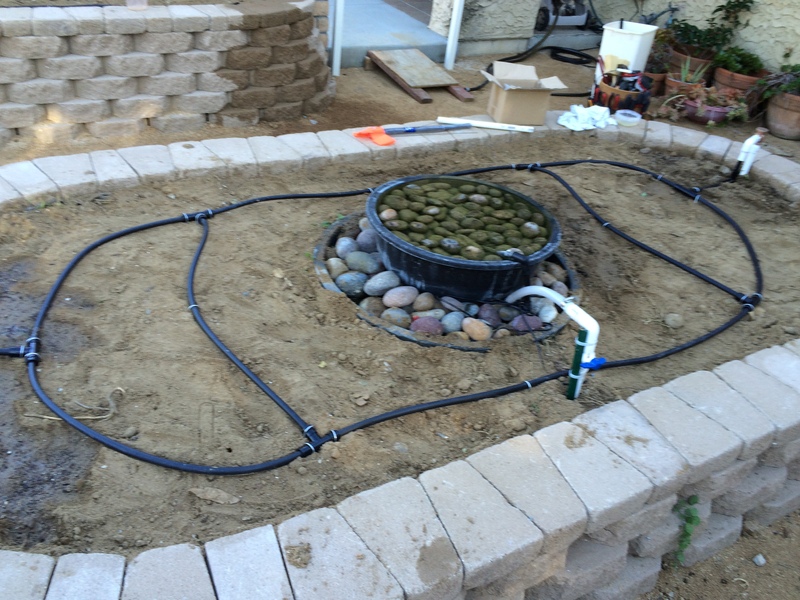 So before you begin in earnest to install the emitters, you’ll need to perform a good flush of the dripline that you just installed by removing the plug and manually activating the irrigation zone of interest. An example of a flush line. Yes, I know what it looks like. It will be covered with mulch, and after I took this picture, I decided to twist it around so it lies flat. That detail out of the way, it’s time to install emitters. I knew that the spacing for me was 18″, so I made a little gauge out of leftover PVC pipe. Punching the emitters into the dripline is made MUCH easier with a special tool, that the manufacturer provides (for a reasonable price). If you’re punching in 250+ emitters into this dripline, then you REALLY need this tool! Yet, even using this tool, the emitters can be a bit recalcitrant. Usually you can feel the barb penetrate the tube and seat properly. If in doubt, give the emitter a tug to make sure it’s secure. Even so, you’ll probably have a few blow off when you first turn on the system. In most cases, reseating the blown-off emitter with the tool will solve the problem. If not, then you can install a “goof plug” and pop the emitter in someplace else. Make SURE you get some “goof plugs” so you have this option. 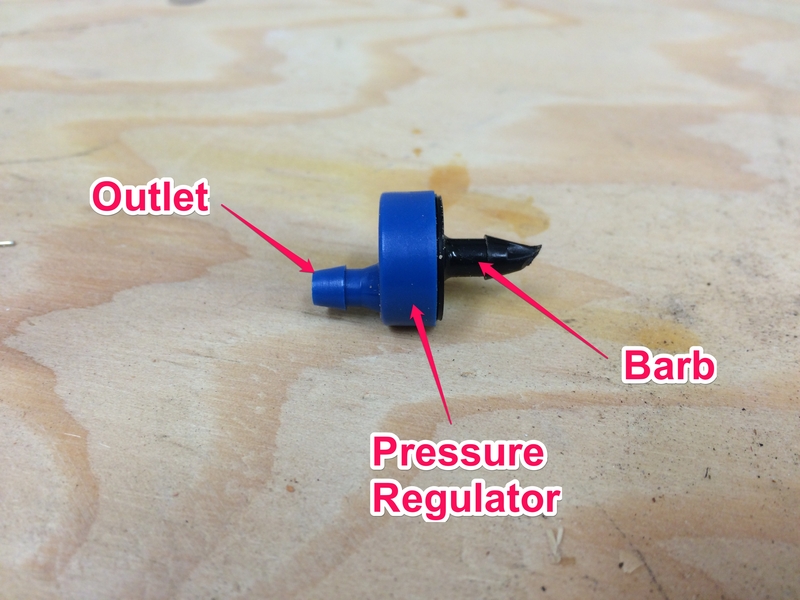 Anatomy of a diaphragm pressure regulated drip emitter. Emitter installed in the insertion tool. 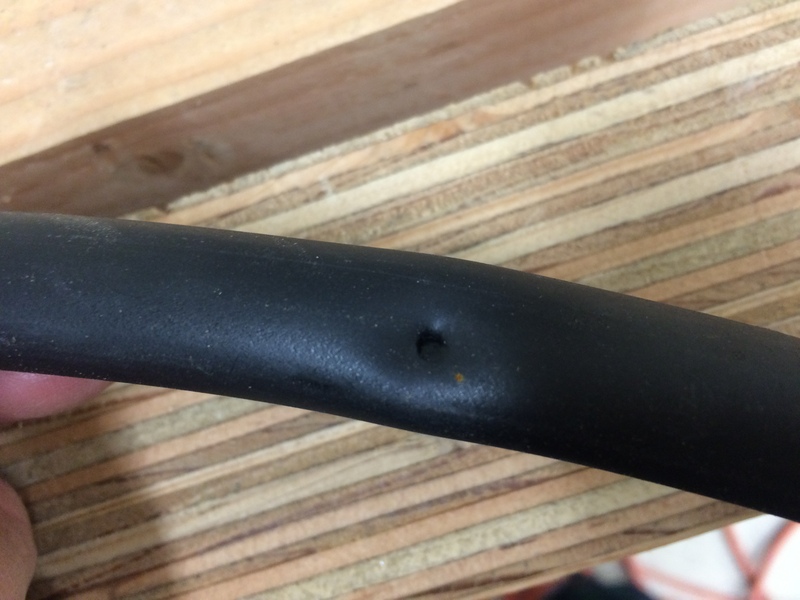 This is the hole that the barb in the emitter punches into the polyethylene dripper line. The material is elastic and deforms, which is good because it provides a good seal. 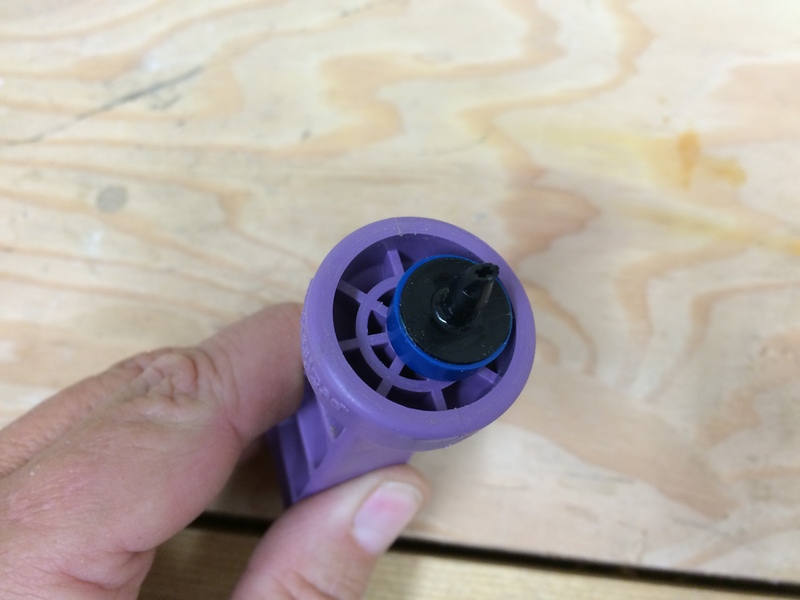 Emitter installed in the polyethylene dripper line. Note that there is a dimple in the line. This is apparently OK because they all look like this and don’t leak. Now that all the emitters were in, it was time to run a test. 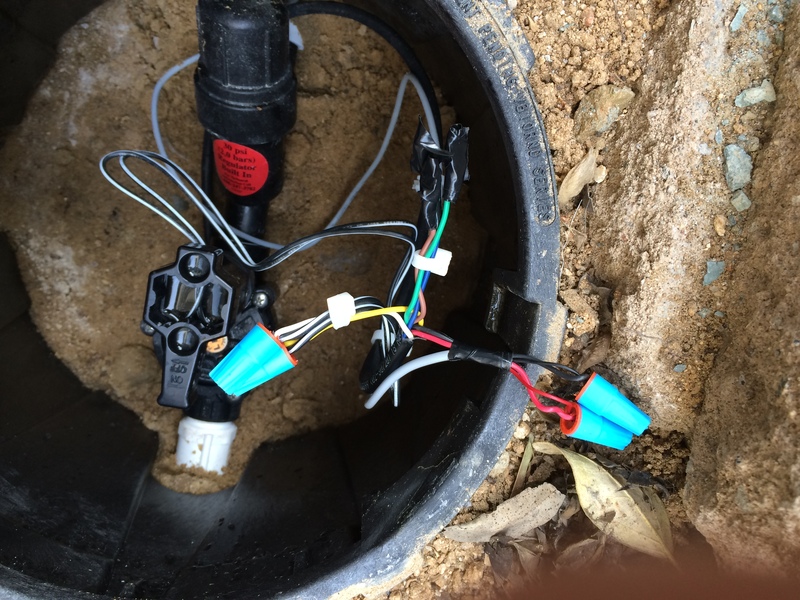 I had previously hooked up all of the irrigation control valve wires to a temporary controller (because I don’t have my smart-home infrastructure built yet) and I now programmed it and turned everything on to make sure it was working. Sure enough, an emitter blew off, but I re-inserted it, and re-ran the test with no problems. 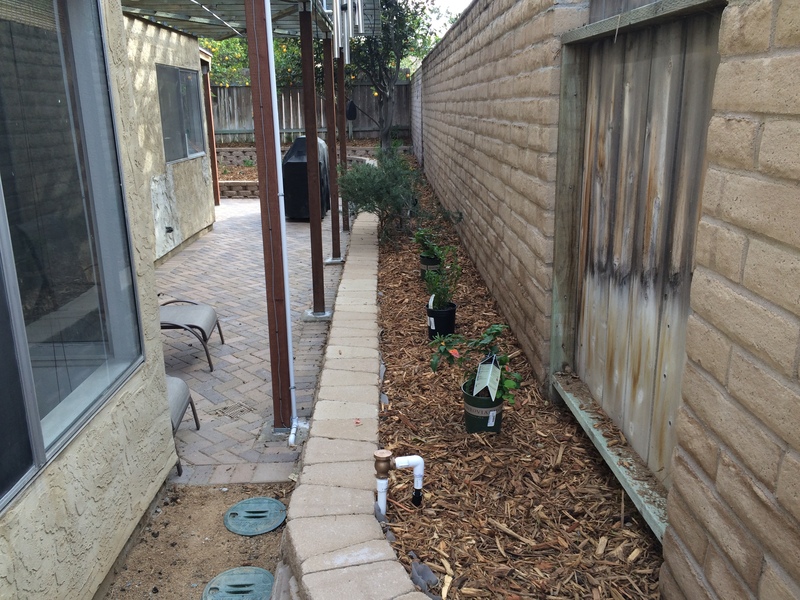 After the drip system is in, the next step is to mulch. 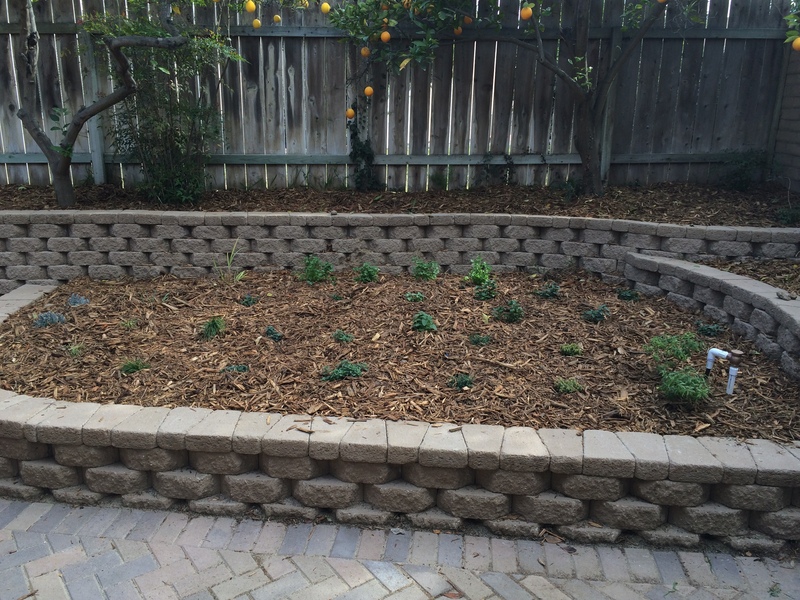 I suppose you could plant first and then spread all of the mulch around the plants, but I figured it was easier to get the mulch in place first, and then push it aside where I wanted to put the plants. Probably about the same, amount of work overall, but because I was using bulk mulch (way cheaper), I wanted to barrow that around before I put up the gate and fencing around the front porch so I could more easily maneuver the wheelbarrow. It was finally time to order the plants. We had a few in pots that we wanted to keep, but by and large, I needed to start from scratch. Shopping for plants can be quite intimidating because of the large variety available. The best thing to do is to figure out what constraints you have (size, sun, water) and then go with plants that tend to work well in your particular area. Even so, there are still a substantial array of choices. After much deliberation, visits to nurseries, and many hours online, I came up with a handful of plants that I thought would work well together. I put them in a list and sent the list to my favorite nursery, thinking that they would order it and deliver it. Well, that didn’t work out so well because (a) several plants weren’t in season, and (b) I didn’t get a chance to see them in person. What I ended up doing was visiting the nursery several times and having the folks help me make good choices of what they had in stock. If I had to do this over, I would perform the research as I did, but then take the list of plants and have the folks at the nursery make suggestions and recommendations based on the overall guidance of the original plan and forget about the delivery or special order stuff. Fortunately, planting is a pretty straightforward process. (1) Position your plants. (2) Move away the mulch and dig a hole. (3) Toss in some fertilizer. (4) Set the plant in the hole and backfill. 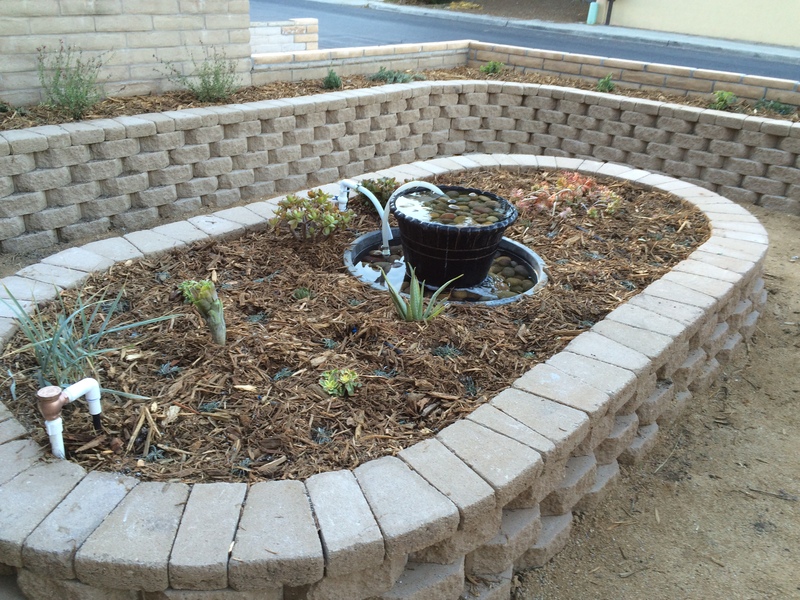 (5) Put the mulch back over the dirt. (6) Repeat for the other 49 plants you bought. 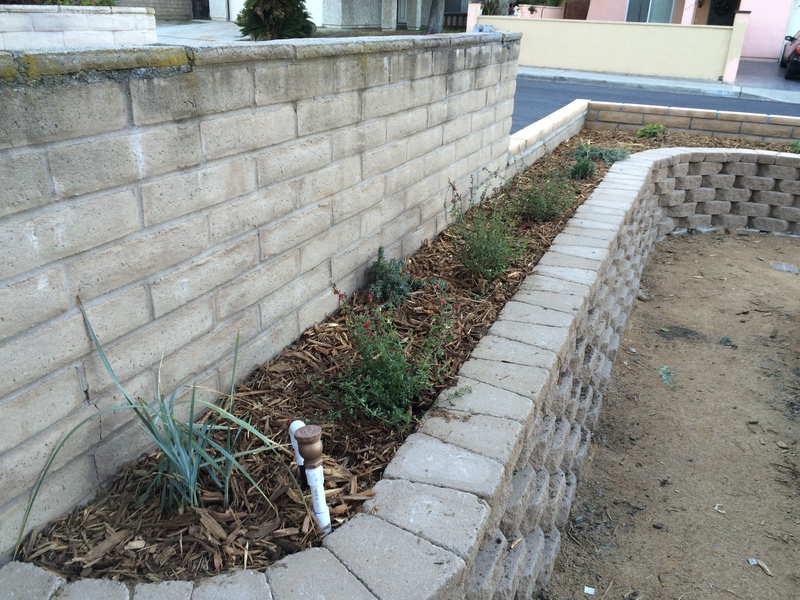 It took me an afternoon to plant my herb garden and another afternoon to plant the rest. 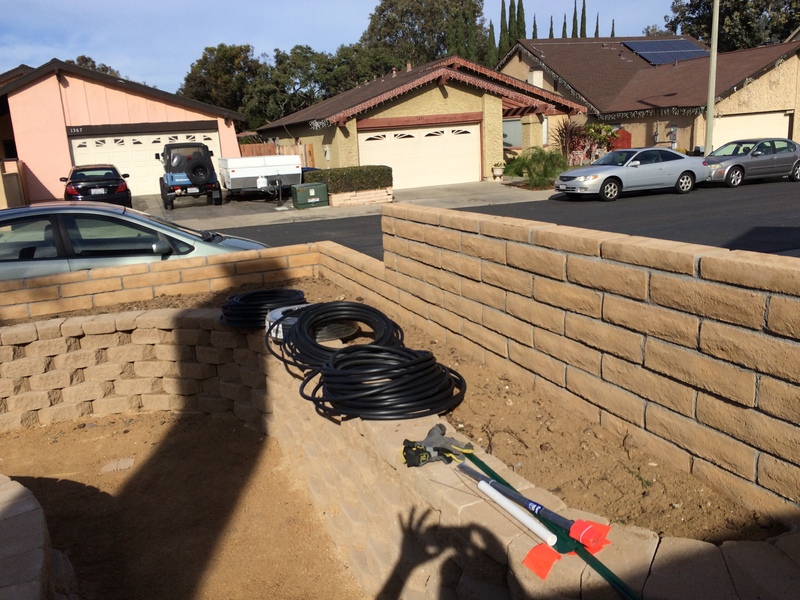 Irrigation and mulching in place, I’m ready to plant! Ready to plant the side yard. This shows how I arranged and spaced the plants while still in their containers. Much easier than digging a hole, planting, and finding out that it really wasn’t where you wanted it. The center planter will be a succulent garden. 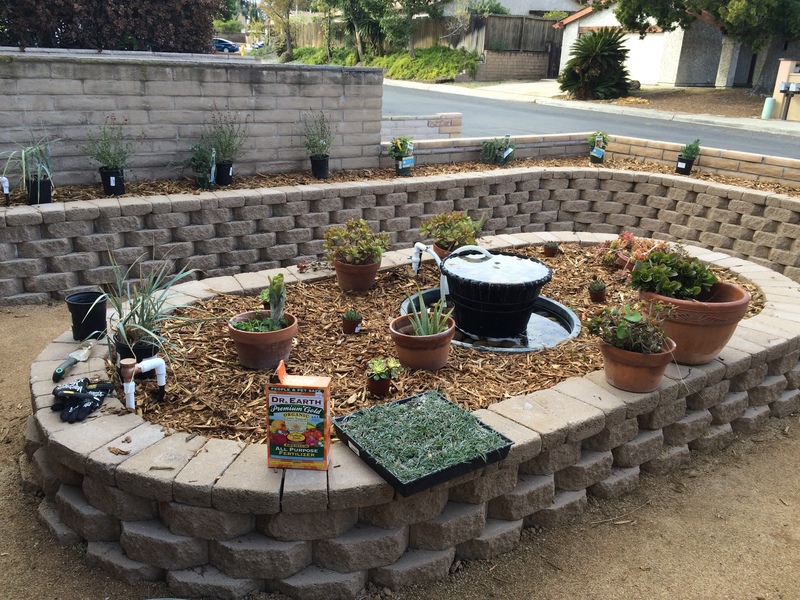 All drought tolerant! Finished edge plantings. Here you see ornamental ryegrass, salvia with red blossoms (substituted for bougainvillea), and creeping rosemary. This is the herb garden. It doesn’t look like much now, but I have lots of yummy treats in store once this gets going. 4 kinds of mint, 2 kinds of thyme, 2 kinds of oregano, italian parsley, chives, culinary lavender, lemon verbena, lemon grass, and sage. I already have a mature culinary rosemary bush, and I have another plan for the basil garden (on the wall under the trellis). 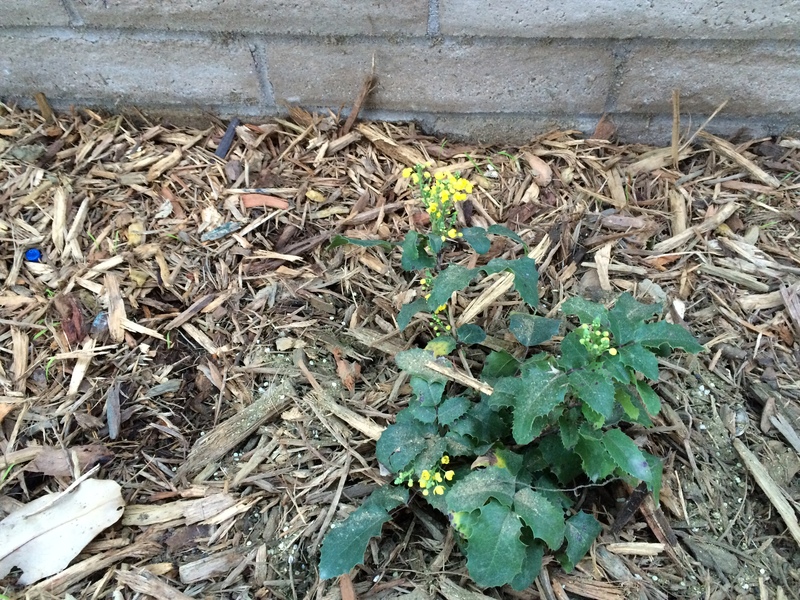 This is a shade-tolerant, water friendly plant which will grow into a nice evergreen bush with yellow flowers. I have no idea what it’s called. That’s why I go to a nursery and have the folks there give me suggestions. 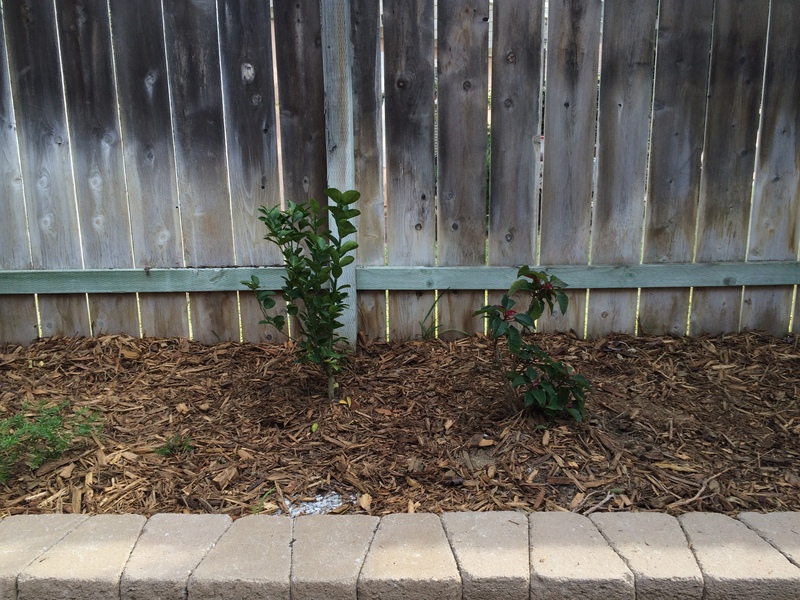 My new mexican thornless lime tree on the left, and a poinsettia on the right. I got the poinsettia from a colleague at work who was selling them on behalf of his daughter. This was 2-3 years ago and the thing has survived, so it’s a hacker and therefore has a place in our garden. I hope that it grows to be the nice evergreen bush that poinsettias become, now that it will have proper care. Let’s face it: I’m a dedicated cat lover. I didn’t used to be, but when I was first dating my yet to be wife, she had mentioned that she liked cats and had many a fond memory of them. My tiny little pea-brain thought: “Well, wouldn’t it be nice to get her a cat because she likes them so much.” She did like the cat, but it came with the newfound responsibility of being a “cat-daddy”. It was all good, though. She showed me how to relate to them, and that they were very affectionate, but their life was lived on their terms, and after a fashion, I came to respect that. Since then, we’ve had many a cat, and I now believe that those who don’t like cats, don’t know cats. Cats have always come into our lives either through the local shelter, or have just shown up. We never pass up the opportunity to attract a stray and needy cat, and, if it is not obvious that the stray is neutered, we get it to the vet (trapping it with a live trap if necessary) and take care of that little piece of business. We started with the one cat way back when, but as Earnest Hemingway says: “One cat just leads to another.” so we’re at four (at the moment). A couple of things that cats need are (a) territory they can claim and (b) places for their territory that are interesting to them where they can perch, play, sleep, and watch. For indoor cats, this can present a challenge, especially if you have more than one cat. The answer is to “catify” your house. There are lots of good ideas out on the Internet about “catification”, and these primarily emphasize making use of vertical spaces, such as shelving, steps, climbing posts, and perches that allow the cats to move around and find more space. However, all cats like to be outdoors. The conundrum is that outdoors can be dangerous to cats because they can become prey to other animals (like coyotes) and can become injured by other cats, cars, and mean people. But, what if you were able to put them in a big cage? And what if that cage shared a wall with your home so that they could have a private “kitty door” they could use at their whim? 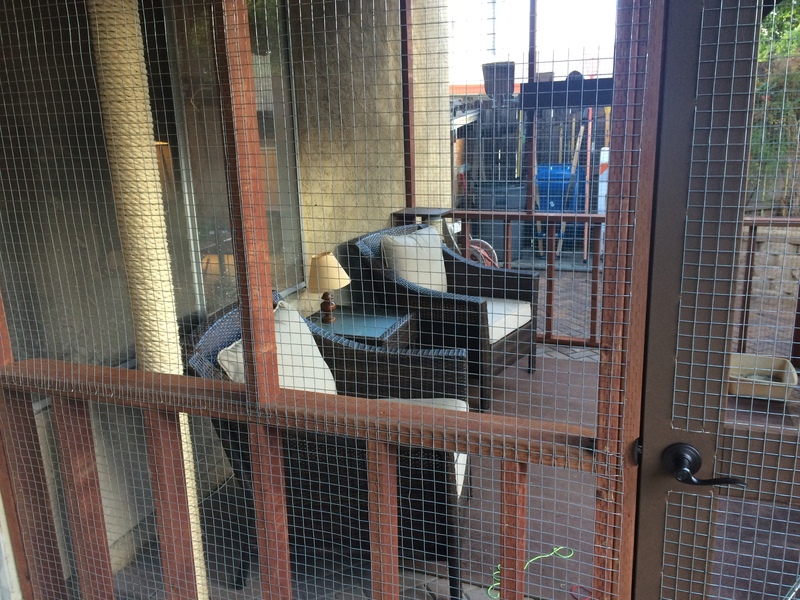 And what if you made that cage big enough for people to have a couple of nice outdoor chairs and a small table so you could enjoy the outdoors with the company of your cats? Say hello to the “catio”. 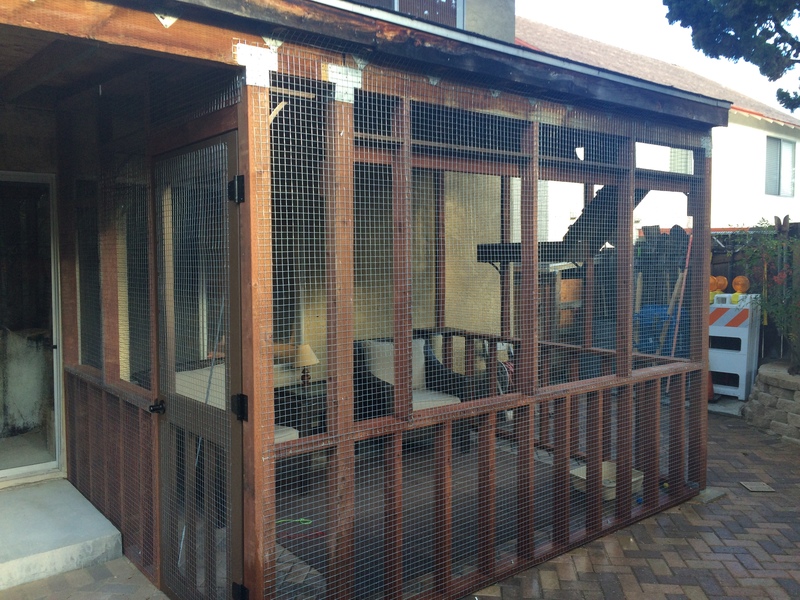 A catio is a patio that has been modified to accommodate the needs of cats that keeps them safe while they enjoy the pleasures of the outdoors. Some are very small — basically a shelf extending from a window with a cage around it. Very popular in cities. 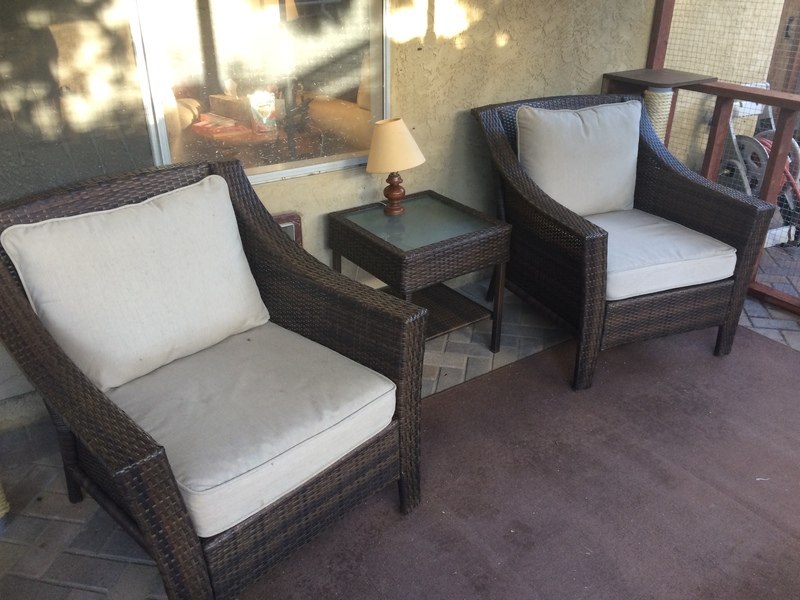 But for a home that already has a patio with a patio cover, as it is in my case, it is a simple matter to add some rudimentary framing, a couple of doors (one cat, one human), and some wire mesh, to have a nicely defined outdoor space that can be enjoyed by the whole family. Yes, cats are part of the family. But, to really bring it up to proper “cat standards”, one needs to add some cat specific architectural details that give the cats places to hide, peek, perch, watch, climb, run around, and sleep. 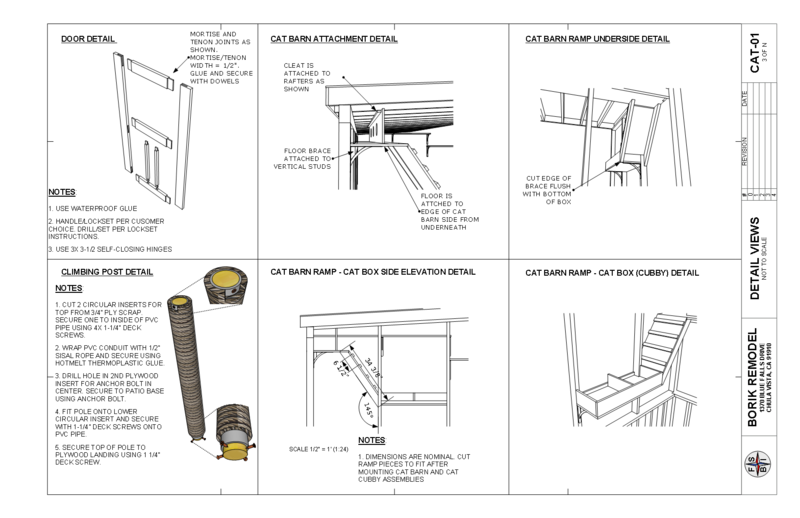 These don’t necessarily have to be complicated, so I decided to have some fun in designing the interior of the catio to provide the cats interesting and fun things for them to do, while still maintaining a sense of style. Here are some pictures of the design. 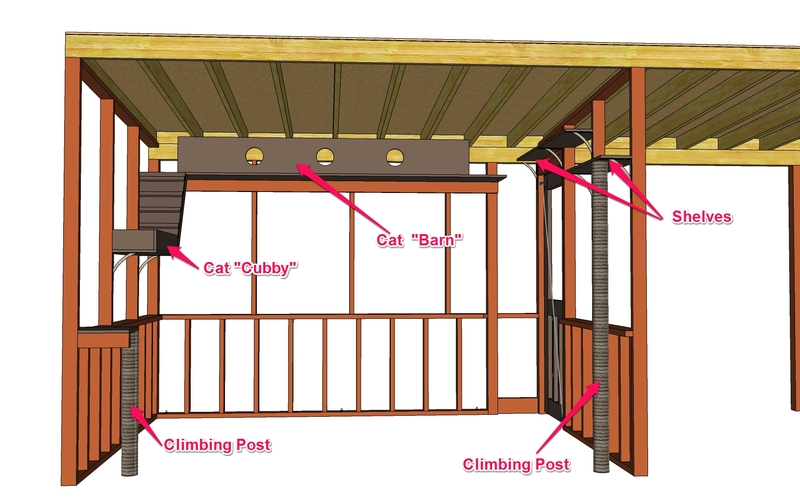 Here is a rendering of the catio with the cat “toys”. There are numerous features that are attractive to cats, such as vertical interest, views outside, places to run, hide, and peek, and places to climb and scratch. The actual building of the structure is pretty simple. I used basic 2x dimensional lumber for framing everything out, and decided to use deck screws to put everything together. 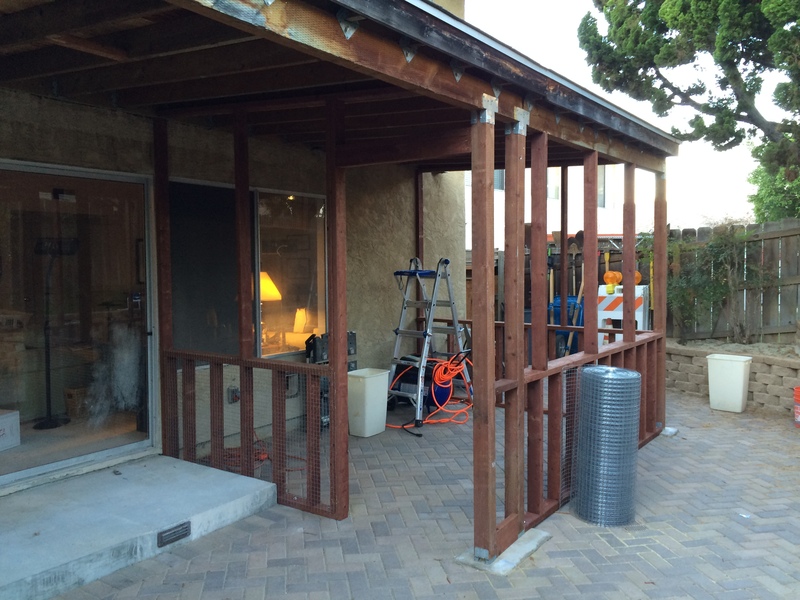 Because none of this is load bearing, and was built against the existing framework of the patio cover roof and posts, I didn’t need a permit. 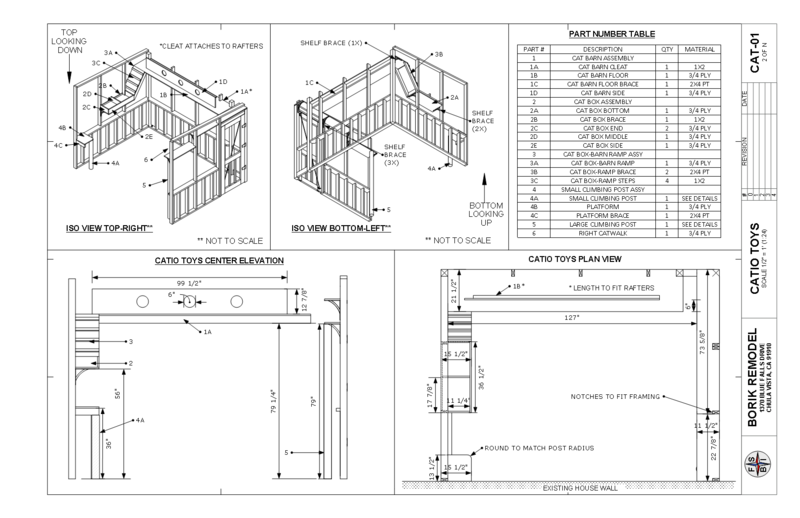 Having said that, I did use my SketchUp modeling program to do a detailed design because (a) it helps me visualize the final product, (b) helps me figure out how I’m going to build it, (c) helps me with the material estimates. I put some effort into the door because it has to be sturdier than a typical screen door, and if you’re using dimensional lumber that is pressure treated, it probably won’t stay square because it is sold as green (wet) lumber and will warp when it dries. I found out this the hard way with my first attempt at a catio. This time around I used kiln dried 2×6 lumber for the door and joined it with mortise and tenons, held together with waterproof glue and dowels. Here are some pictures of the final design. Detail views of the construction. The “before” picture. 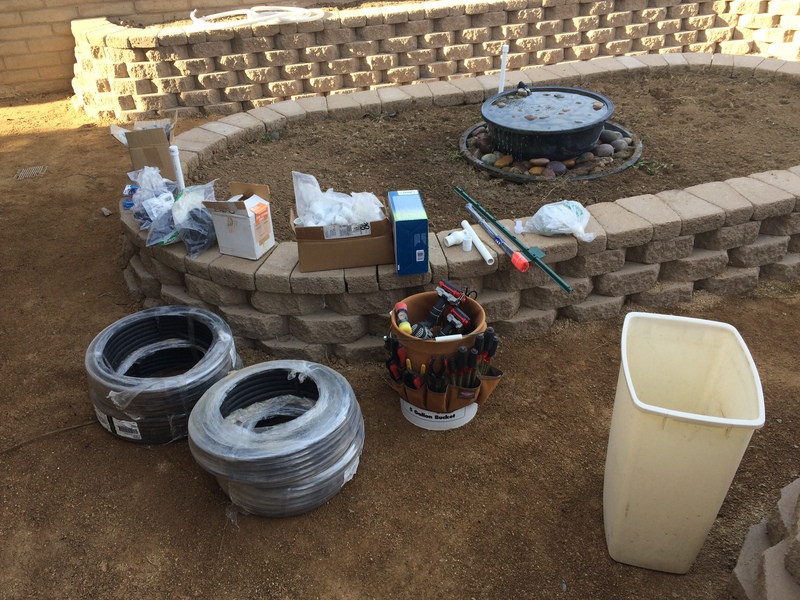 All tools in place and materials staged (on the left). Time to start framing! The framing is done! I paid particular attention to the frame for the door, making sure that it was square and plumb. 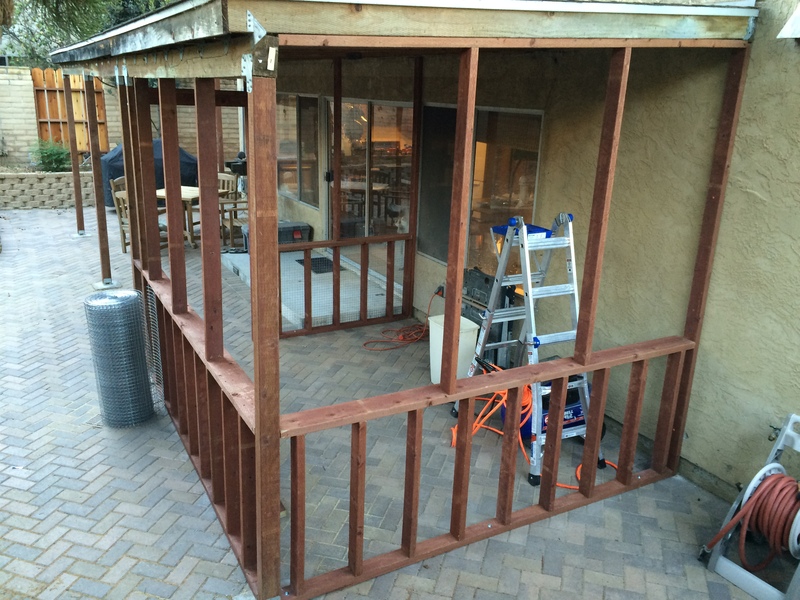 Framing is spaced at 36″ to fit the 36″ wide roll of wire mesh (with overlap). This minimizes the time cutting the mesh. After the framing was up, I installed all of the “cat toys” and the door, and then took them all apart for painting. 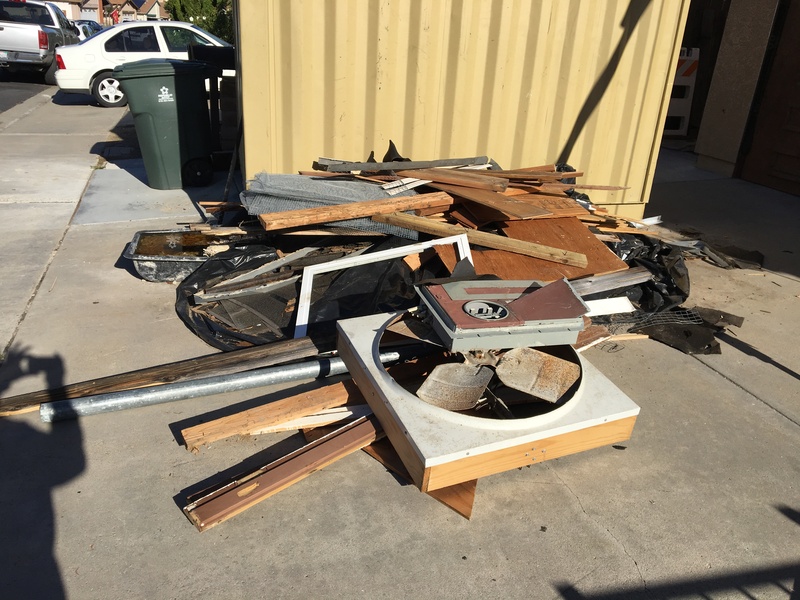 The plywood and untreated wood needs protection against the elements, and it’s easier to paint these parts while they are flat, and disassembled. They all go back together pretty fast! 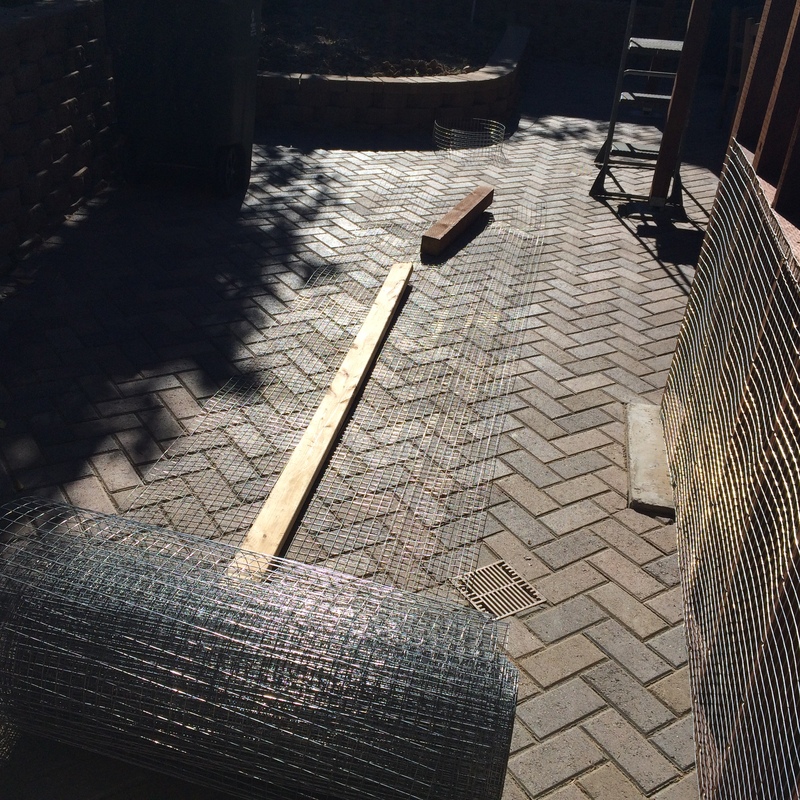 The last part is covering the structure with wire mesh. 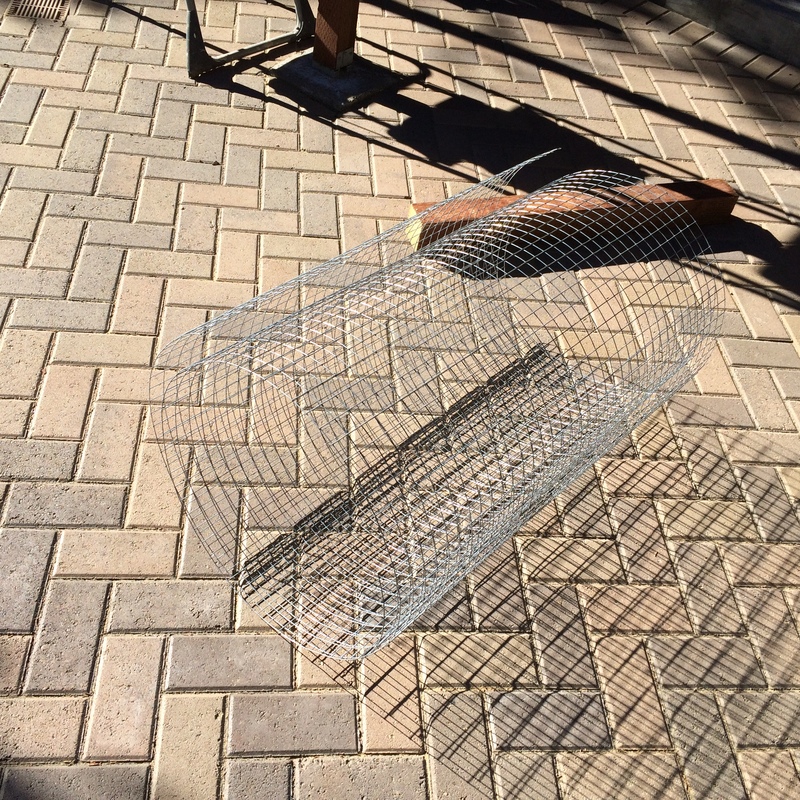 I used a 1″x 1″ 14 ga galvanized mesh that is available from Home Depot if you special order it. The first time I bought this stuff several years ago, I paid about $100 in shipping because the stuff was not available locally. What I found out was that if you find the product you want from a manufacturer that does business with Home Depot, you go to their “pro” desk and ask them to special order it. No shipping charge! 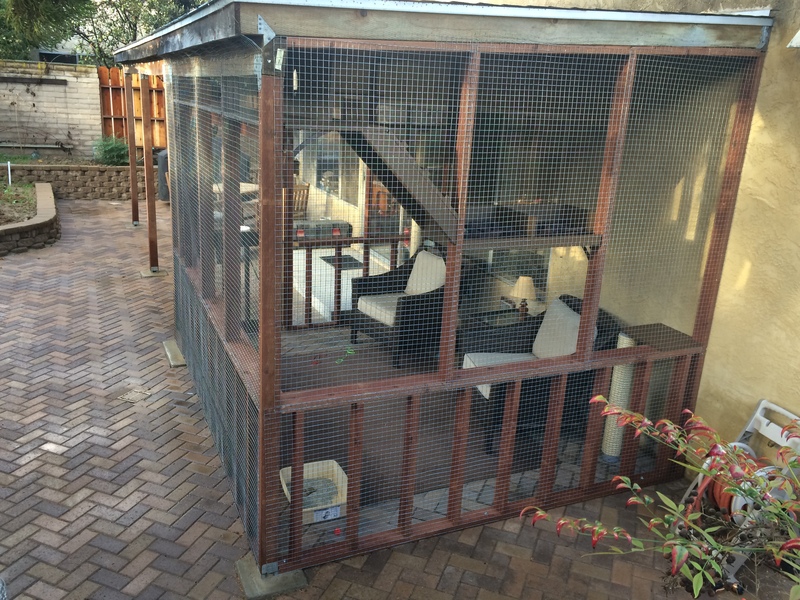 I found the 1″ x 1″ mesh to be ideal because (a) it looks nice (chicken wire makes it look like a chicken coop — not my decor), (b) it’s sturdy enough so the cats can climb on it and not deform or make holes in it, and (c) it’s large enough to minimize the obstruction of the view from inside, yet small enough to prevent unwanted “visitors”. The visitors that are small enough to get through are taken care of by the cats…. I chose a 36″ mesh width because that fit very well with the proportions of the framing, which minimizes the amount of cutting of the mesh. It also makes it easier to handle when attaching to the framing. Attaching the mesh single-handedly can be challenging because the mesh has a “memory” that tends to spring the damn stuff back on top of you and give you scratches. When people see my recent scratches, they ask if they are because of my cats. Well, in a sense, yes. But I digress. I found that laying a long piece of 2x lumber lengthwise will (a) prevent the roll from coming back on you when you’re cutting it, and (b) can help you stabilize the piece when you fit it to the frame. The other “must-have” is a pneumatic stapling gun. It makes aligning the mesh fairly straightforward, and for quick work in stapling it down the rest of the way. Yet another reason to buy that “new tool”. 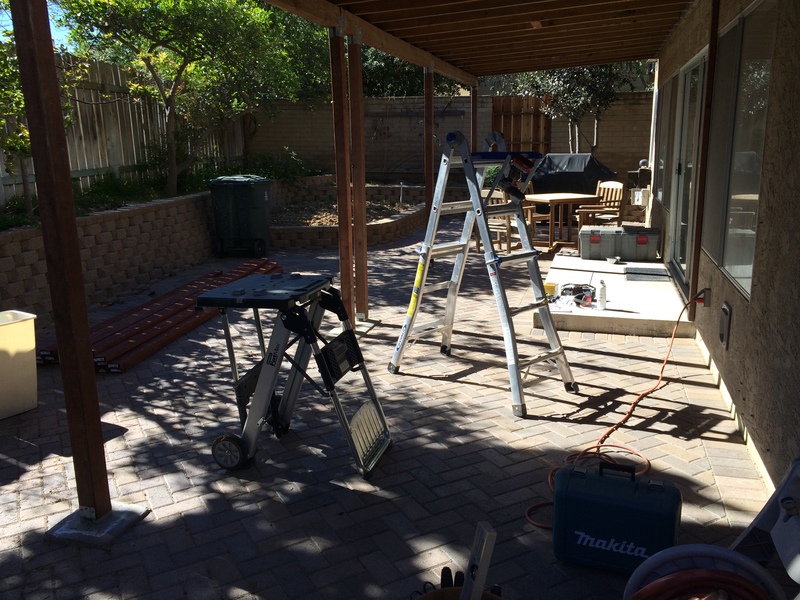 At least one new tool per project…. that’s my motto. Using a spare 2×4 to hold the roll of wire mesh in place for measuring and cutting. The mesh has a “memory” which tends to roll it back to its original shape. If you try to straighten it out, chances are it will be deformed when you staple it in place. The best strategy is to work with the spring-back. Align to the framing by tacking the middle of one end to the framing, and then aligning one edge to the framing and tacking the edge in place. Once aligned, it is relatively easy to “unroll” the mesh as you progressively staple it to the frame. The 4×4 is being used to hold back the “spring” in the mesh. 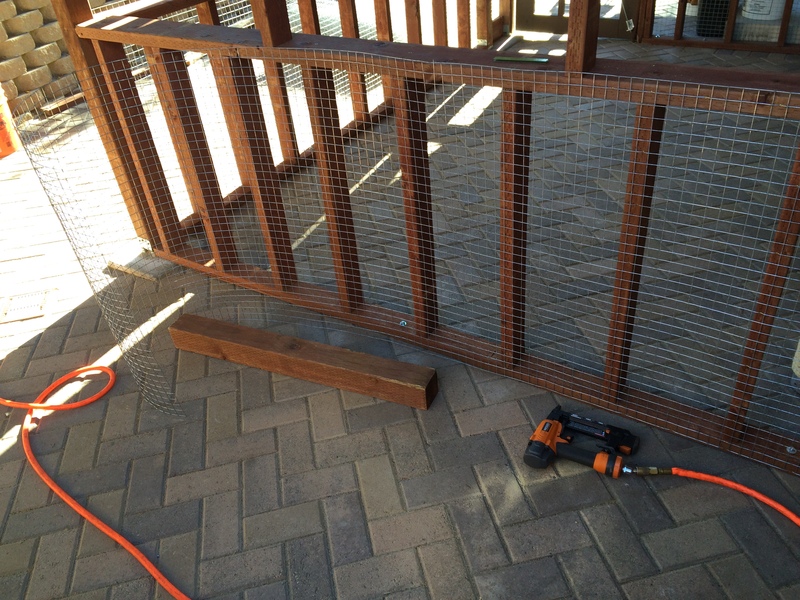 Once the mesh is aligned, it is easy to tack in place with the pneumatic staple gun. Finally, having a little “cat door” is essential because you want the cats to enjoy the space when they want to. And you don’t want them bugging you. There are many kinds of animal doors available, and I chose one that had a magnetic strip which keeps the door vertical when not in use, plus a 4-way lock (open, locked both ways, locked in, locked out). Some come with an RFID chip that you put on your cat and the door allows only your cat to go in and out, but that was way too fussy for me. The catio makes an elegant (well, at least consonant) outdoor space where we can enjoy our cats and the outdoors together. Is it cocktail hour? The finished product. Suitable for human and beast. The catio should be appealing to both cats and their caretakers. A catio should be a place where the cat caretakers can enjoy the space along with the cats. Cats like human companionship, and we can share and enjoy this space with each other. In my last post, I mentioned all of the “Christmas” shopping I did in getting all of the parts for my buried services. I’m deep into digging (more on that later), and I actually am looking forward to spending some dedicated time over the Christmas and New Years holiday to make some really good progress. As usual after Thanksgiving, our neighbors decorated their homes with lights, and it really makes the street look nice. We would always participate, putting up some tasteful white lights and some garlands. In fact, my remodeling plans call for an exterior plug, controlled by a switch, that will be installed expressly for Christmas lights. But that is in the future, and for now, I felt I had to come up with something that was appropriate for the season, yet fit our “decor” of a torn up yard, complete with piles of dirt and trenches. Honestly, the exterior of the house and property will look no worse than it does at the moment. What a friggin’ mess! Then, in a flash of insight, I had the answer! My lovely wife always encourages me to “use what I have”. I think this comes from her Scottish heritage, and I appreciate and admire her way of making elegance out of frugality. In rising to that challenge, I took a look at these traffic barriers that I had, and it gave me an idea. I was required to buy traffic barriers with flashing lights for the dumpster(s) that I needed to put on the street, marking where the dumpster was, lest an errant driver not see it and run into it at night. I swear that the drivers around here are so fu#&*@’n dumb that they don’t need any assistance from alcohol to run into a dumpster in broad daylight. And swear I do. Profusely. When I’m driving. Although I try to elicit visual pictures with my writing, this video is worth 454 words. Good thing this blog has a word counter, otherwise I’d be guilty of false representation! (OK that’s 472 words). Everyone have a wonderful holiday season, and I promise I’ll have more posts in the near future.